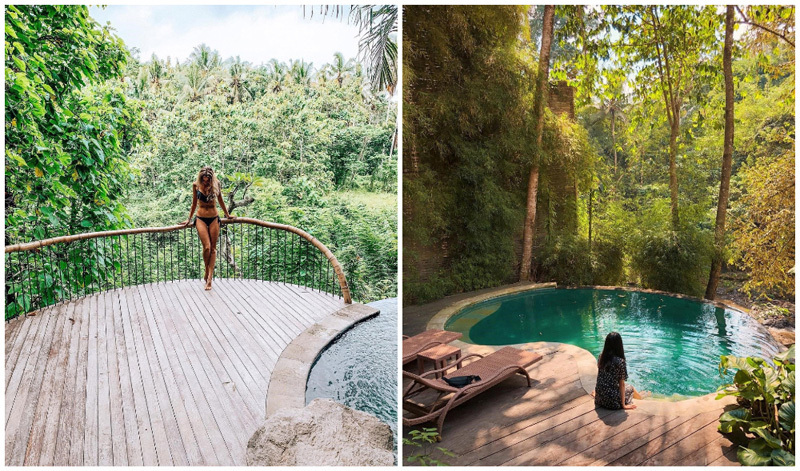 If nature therapy is your kind of holiday, a forest hotel is what you should be looking for while in Bali as they are simply impressive! Yes indeed, this island is more than just gorgeous beaches. 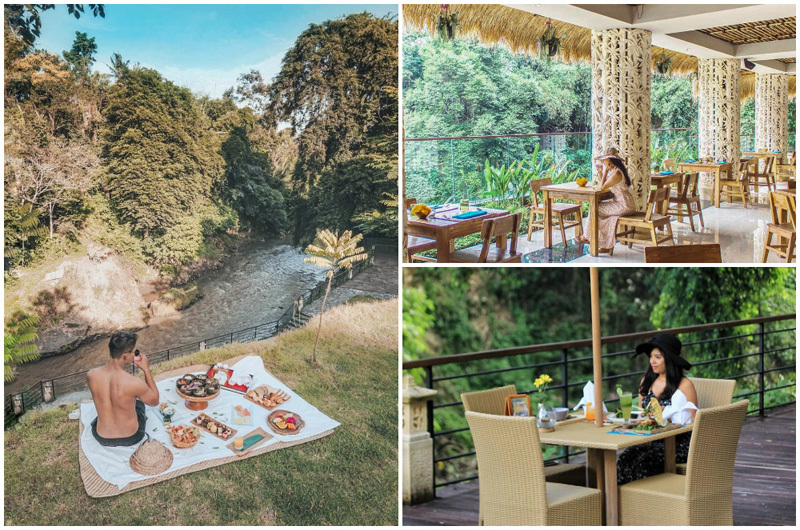 Now imagine this – you wake up to the sounds of chirping birds and the view of pristine lush greenery while breakfast is served floating in your private pool. Doesn’t get any better, right? 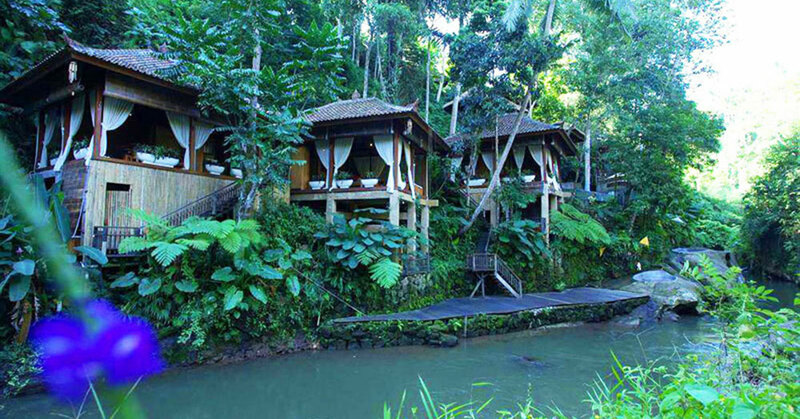 Leave the city madness and enjoy luxurious jungle retreats to let loose your inner Tarzan! 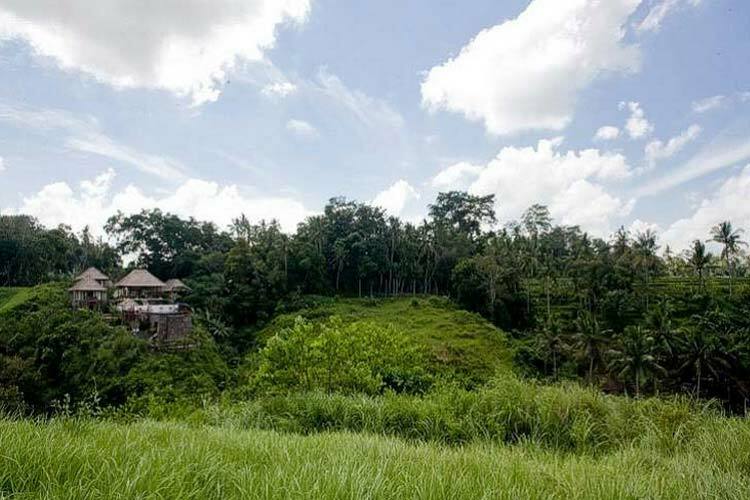 Here, you can reconnect with nothing but lush green jungles, rich plantations, and clear river streams all around you. 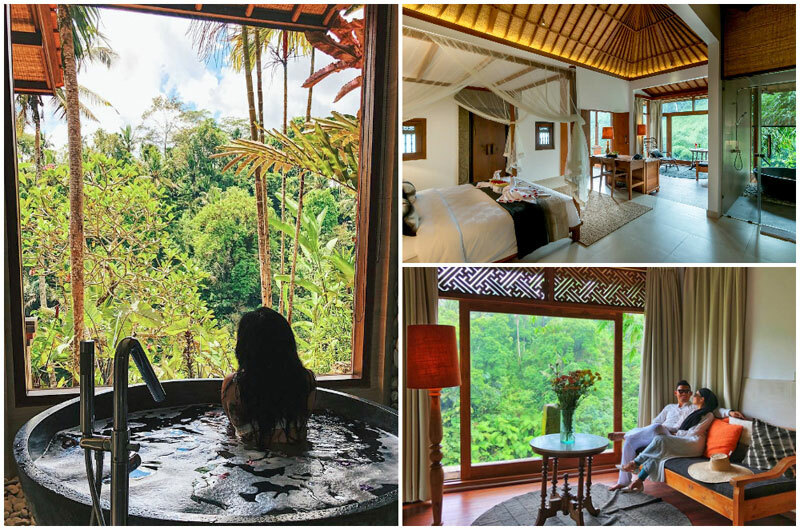 If that kind of holiday sounds rejuvenating, then start getting your bags packed to escape to Bali’s best jungle resorts and get reacquainted with Mother Nature – in luxurious comfort! Note: The prices reflected below are low season rates, and they exclude tax and service charges. Accommodation rates often change with room availability and low or high seasons. We recommend double checking for the final prices before confirming your booking. 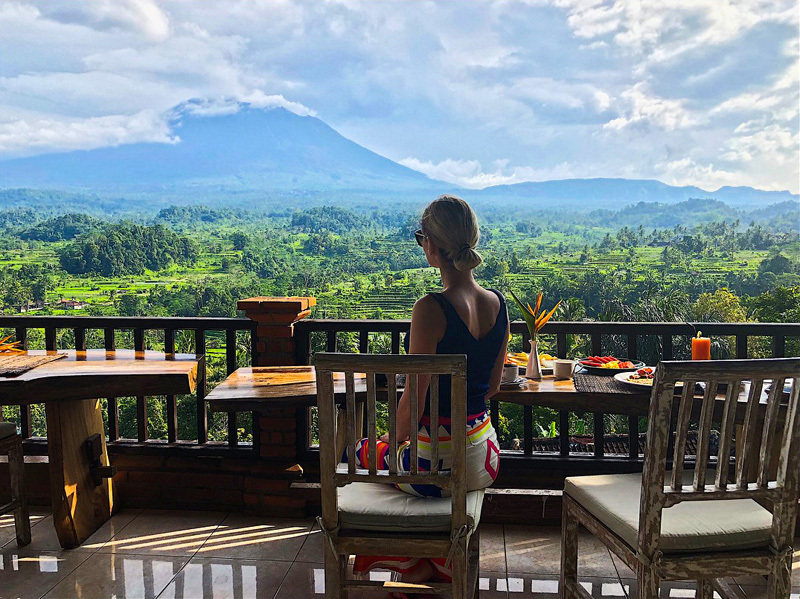 Nothing is more comforting than lounging your heart away on a hammock overlooking the rice terrace outlined by the view of mountain peaks guarding from afar. 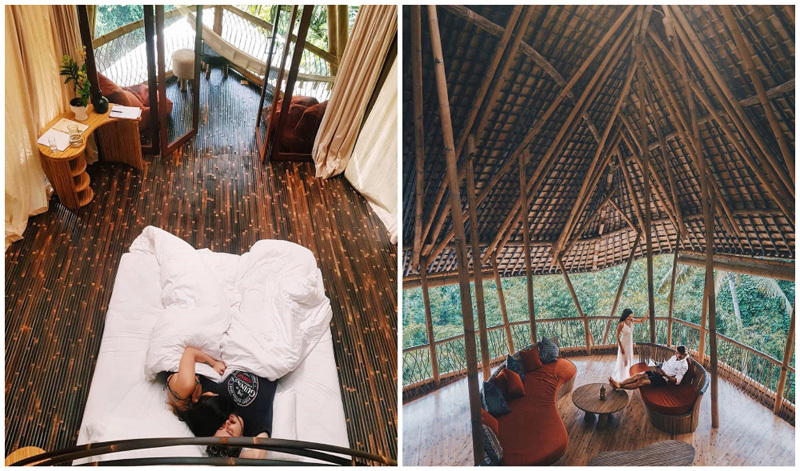 Camaya Bamboo House is a green haven where your wildest romantic dreams come true. 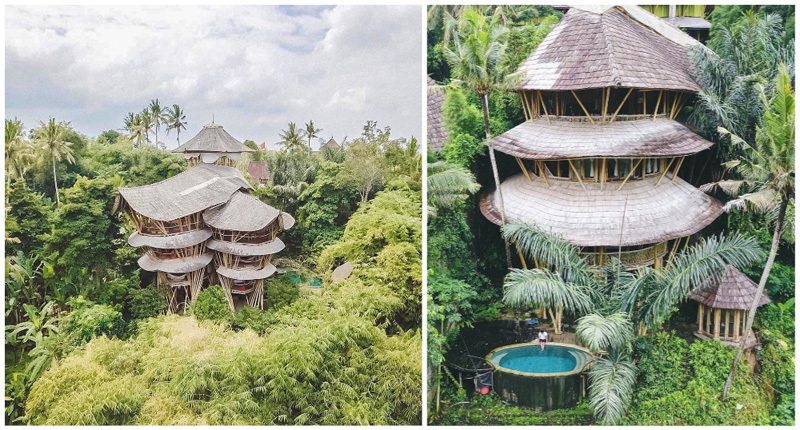 This gorgeous villa is entirely made from bamboo and is surrounded by panoramic natural wonders; ranging from rice terrace, rainforest to evergreen hills. 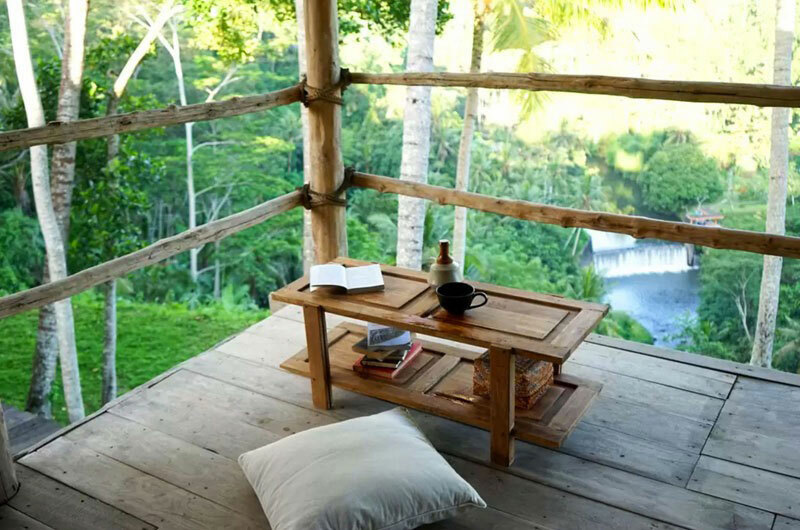 Here, you can rest while being completely guarded by mother nature. Staying a night or two here guarantees you with two bedrooms, a private kitchen and an open shower in the building. 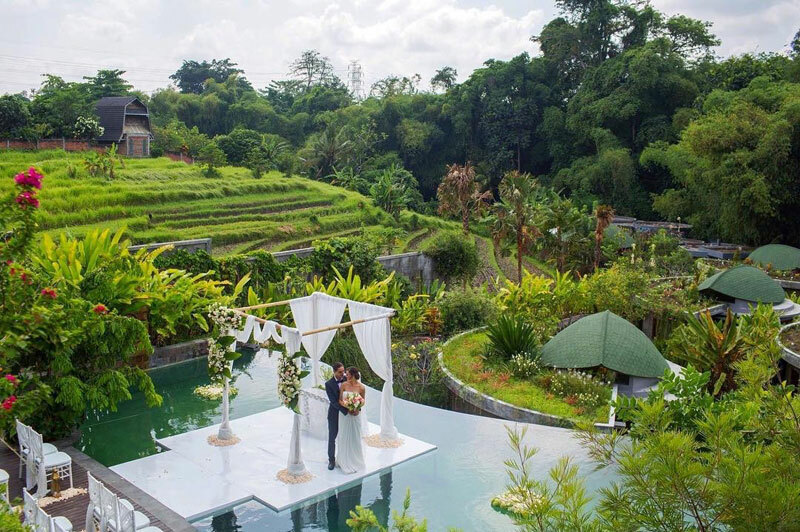 But what’s more convenient is that the villa will provide you with a free scooter rental, so you can embark on an adventure to discover Bali and its beautiful surroundings. 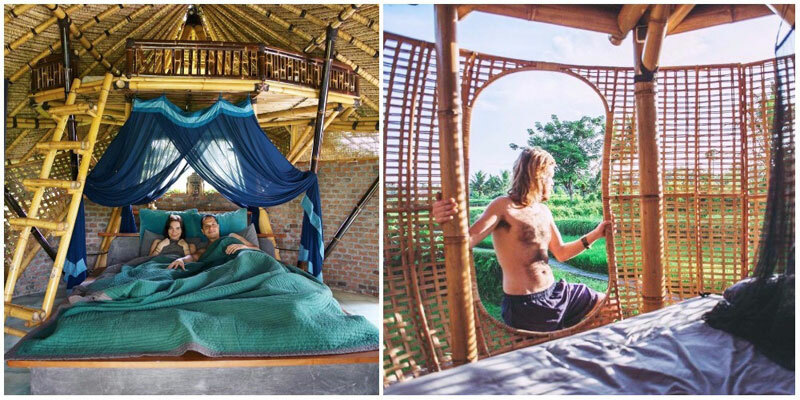 If you don’t feel like getting adventurous, relax and enjoy a peaceful stroll amidst the rice fields, lay on your hammock and appreciate the fantastic view, sign up for a yoga or cooking class – your holiday, your choice! 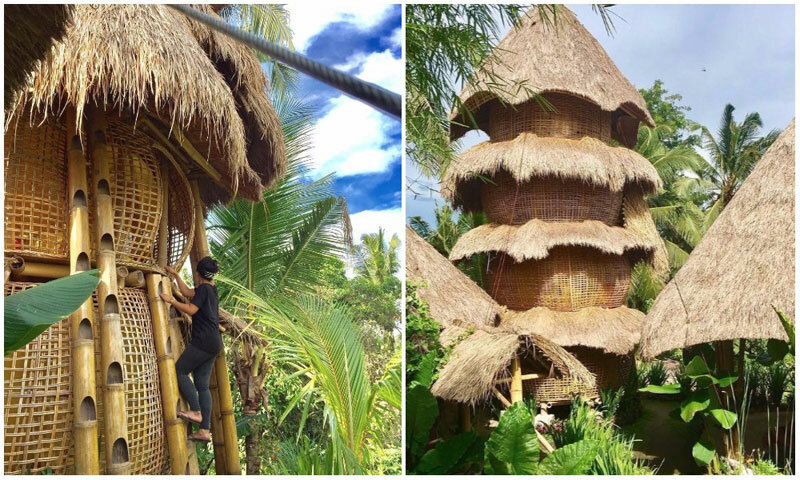 Green Village is not just a simple bamboo village where travellers seek refuge from the chaotic city, but it is also a global living community that connects individuals who share the same interest in building a greener and more sustainable world. 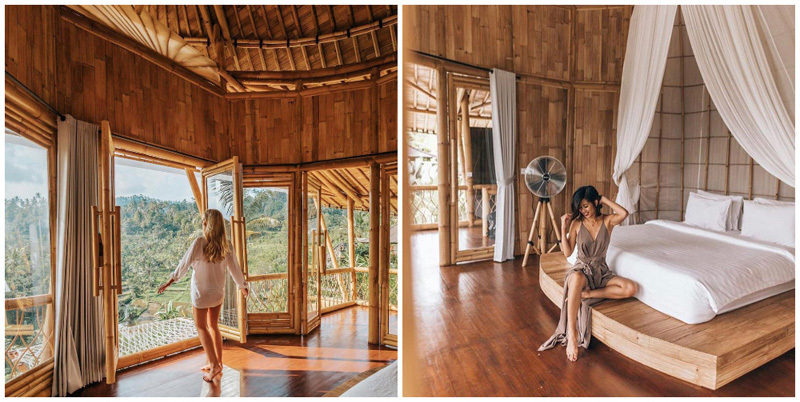 This bamboo villa is perched on the sacred Ayung river valley and boasts a brilliant architectural design, greatly complemented by lavish amenities. 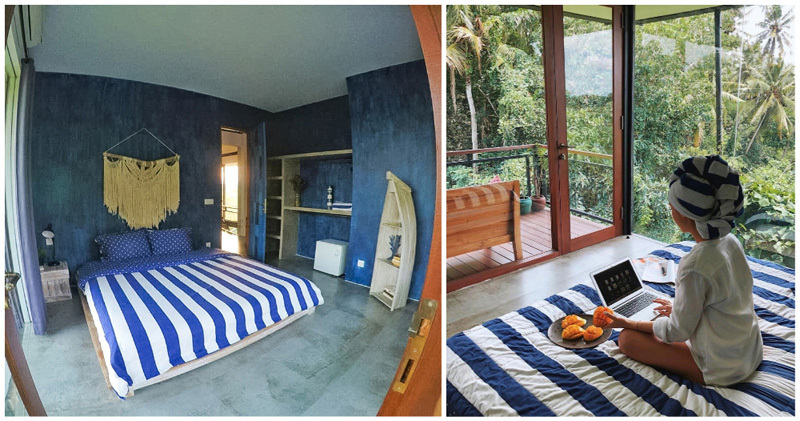 It is a 4-storey villa that comes with three bed bedrooms, each with ensuite bathrooms, a private kitchen plus dining space, a plunge pool and even a workspace on top of the building. 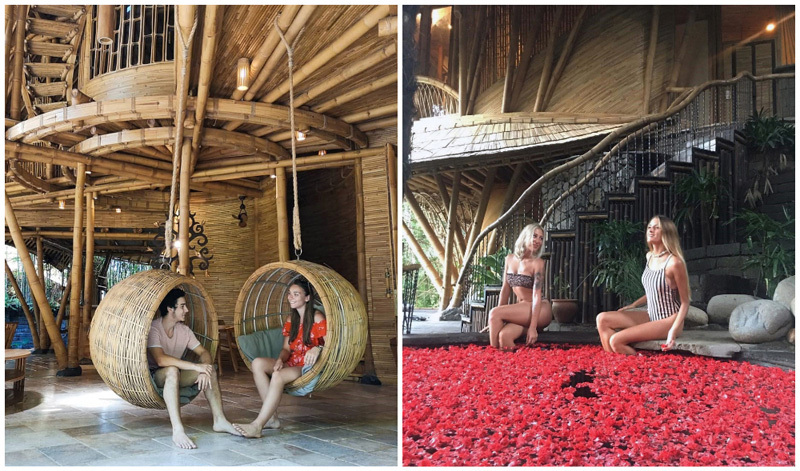 Instagrammers will be captivated by the charming interior design that is mainly made from bamboo – every spot here is perfect for your next popular Insta-post! But the biggest winner here will be nature lovers in search of lush panoramic views. 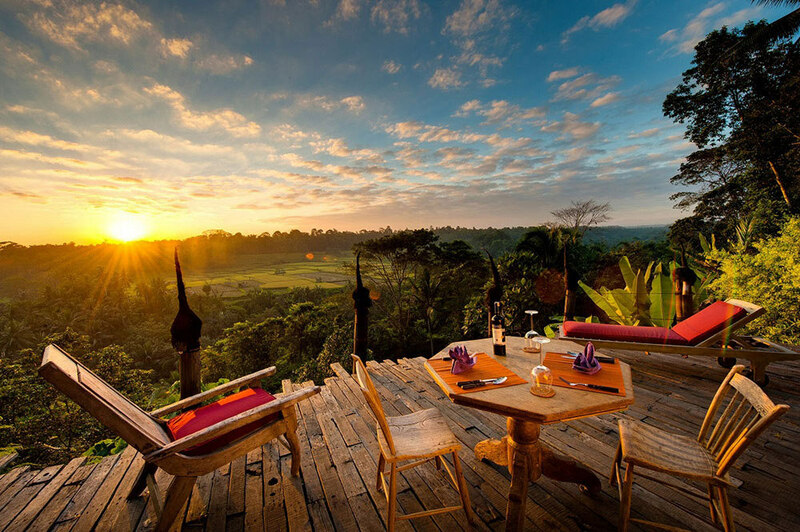 Feast your eyes with 360° endless views of nature beautifully set in the Ayung river valley. Staying here doesn’t only mean that you get to seek solitude in a green sanctuary but you also get the opportunity to learn how this little community is fighting for a better future. Feel free to sign up for a walking tour or visit the nearby Green School – it is an enriching experience for adults and kids alike as you get a better understanding of the efforts to create a sustainable world. 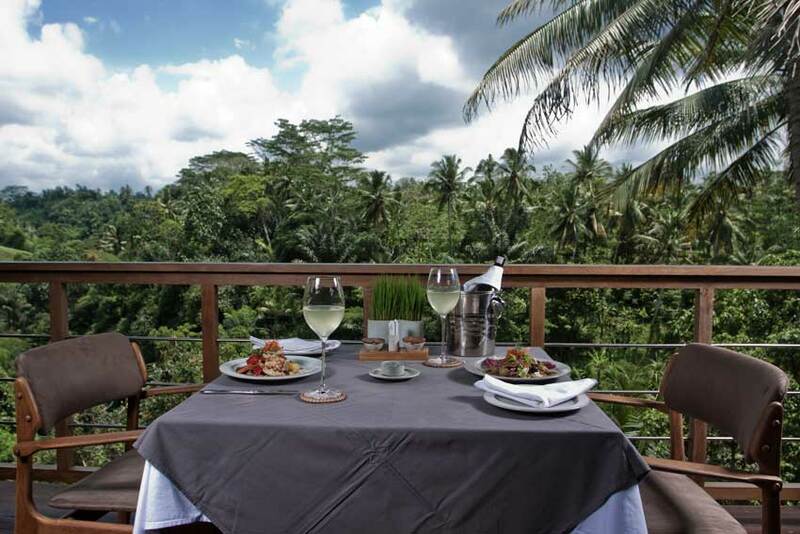 Have a tryst with luxury and nature at its best at this sprawling resort at the edge of the West Bali National Park. 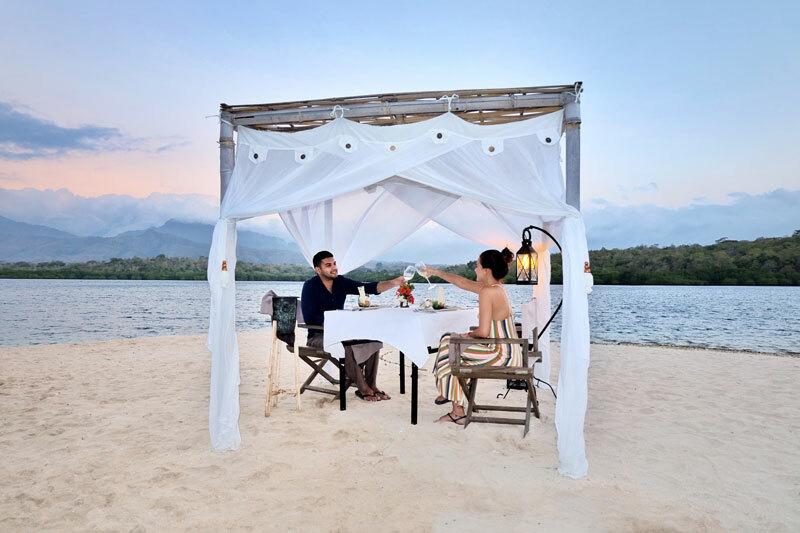 Here, you’ll enjoy the best of both worlds, with stunning views of the protected rainforests and Menjangan island (well-known for its rich marine life) and stay in eco-friendly luxury tented villas without ever having to step out of your comfort zone. You’ll almost feel as though you’re staying in your very own African safari! 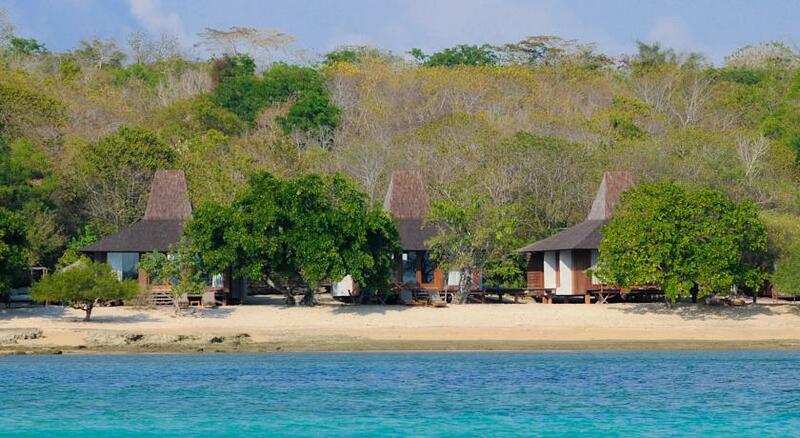 Mermaids and ocean lovers come to West Bali for its rich marine life and more untouched waters. So if you’re either, you must sign up for one of the underwater expeditions offered by the on-site 5-star PADI Dive Centre, where you can get professional diving and snorkeling experiences! Underwater Insta-worthy shots with coral reefs as your backdrop? Yes please! If you prefer to be above the water, go kayaking, canoeing or jungle trekking (hugely popular!) offered by the in-house Pasir Putih Dive Centre & Watersport. When you’ve had too much fun (if it can ever happen! 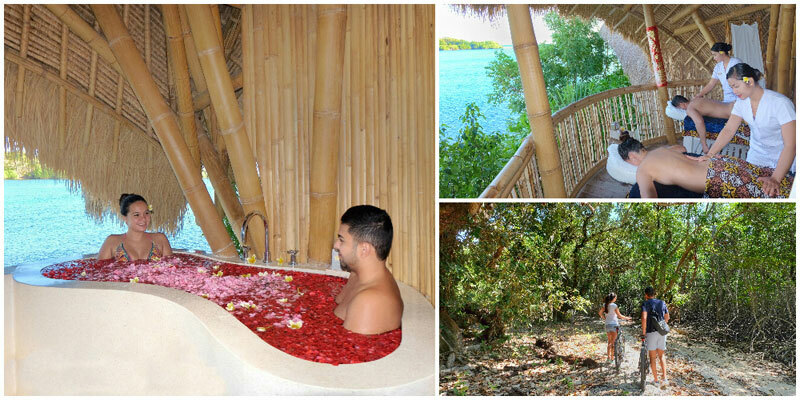 ), the next best thing to do is to simply relax in the untouched natural landscape. 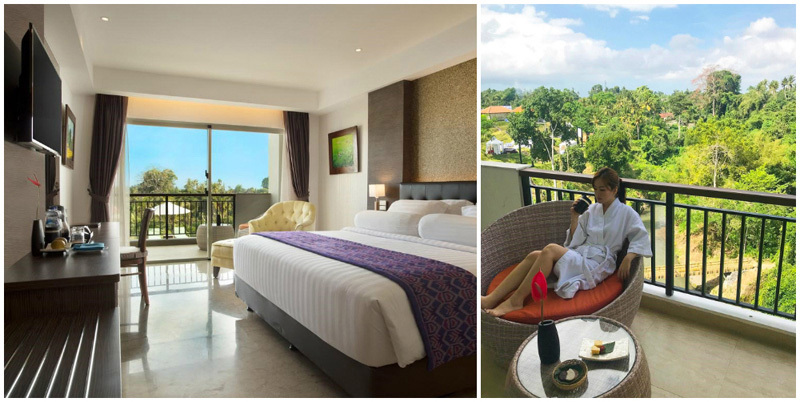 Take a stroll along the mangrove-lined coastline, or unwind at the in-house spa where you can get a pampering massage with a full view of the sea. 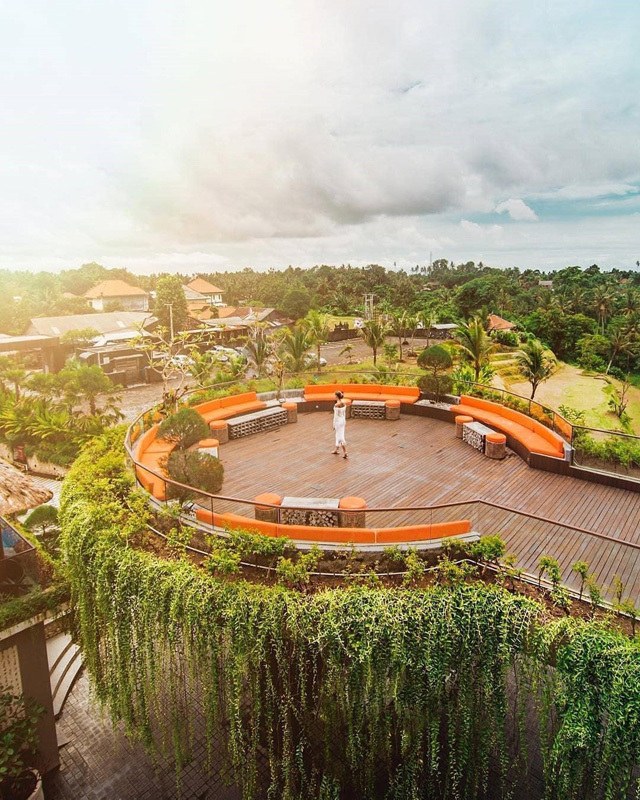 As the skies turn into hues of orange and yellow, head to Pasir Putih Beach Club, where you get to spice up things with your favourite cocktails and stunning sunset ocean views right over the gorgeous infinity pool. After the sun goes down, it’s time for that romantic dinner with your loved one on the soft white sand beach under a sweet cabana. In the west, the vast sparkling starlit skies will make your date night extra special. All these luxuries in the great outdoors – that’s what you call camping with all the glamour! If volcano trekking isn’t for you, that doesn’t mean you have to write these natural wonders off completely. So why not check into a hotel where you can observe their beauty from afar? 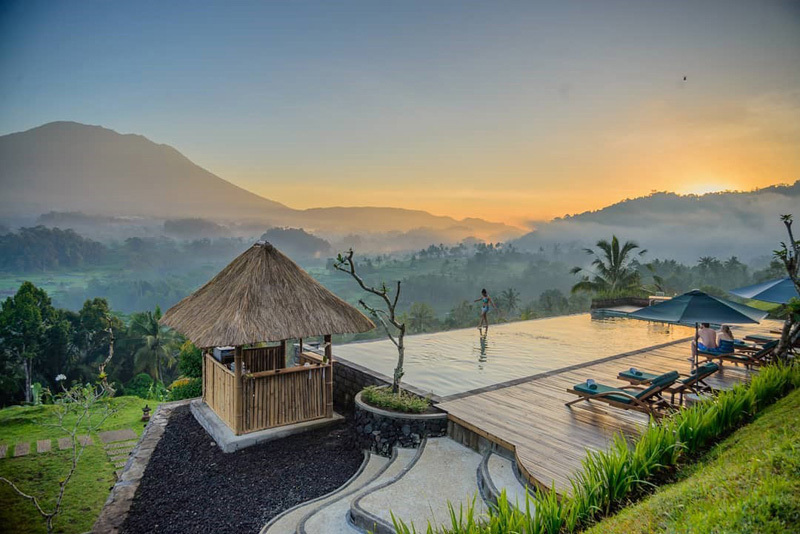 Villa Patal Kikian Sidemen features an outdoor infinity pool with the best view of the imposing Mount Agung, making any morning swim or mid-afternoon dip you take to cool off extra special. 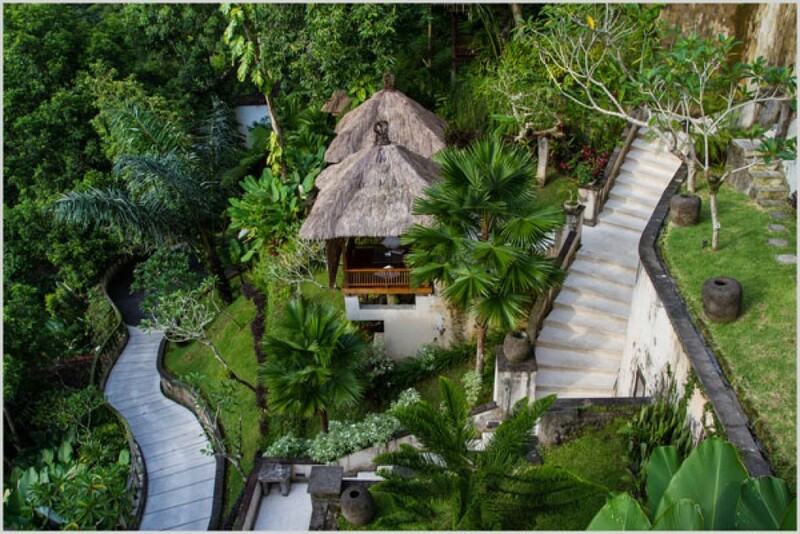 Or, start your morning off with a stroll in the Balinese gardens of the resort for a burst of fresh, fragrant morning air before beginning your day. 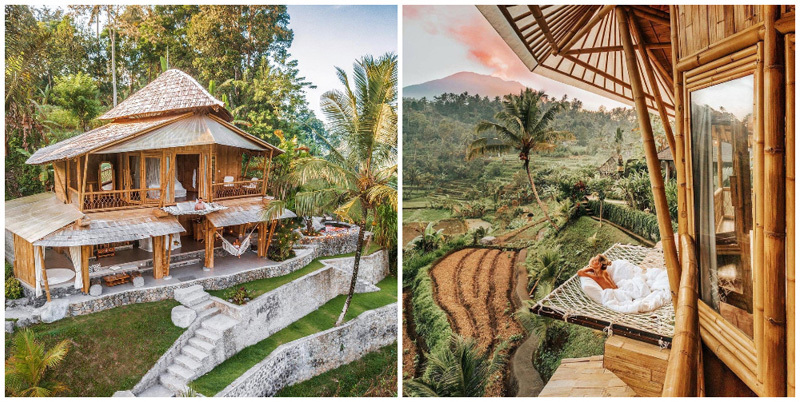 When you start imagining the relaxation and serenity and picture yourself with a chilled mango juice on the terrace, or hanging over the edge of the infinity pool, overlooking jaw-dropping views of Bali’s holy mountain, it’s pretty easy to get into the swing of really planning a little trip. This villa is tailor-made for those who want a place with incredible beauty and serenity, but far away from the hustle and bustle of nightclubs and traffic jams. 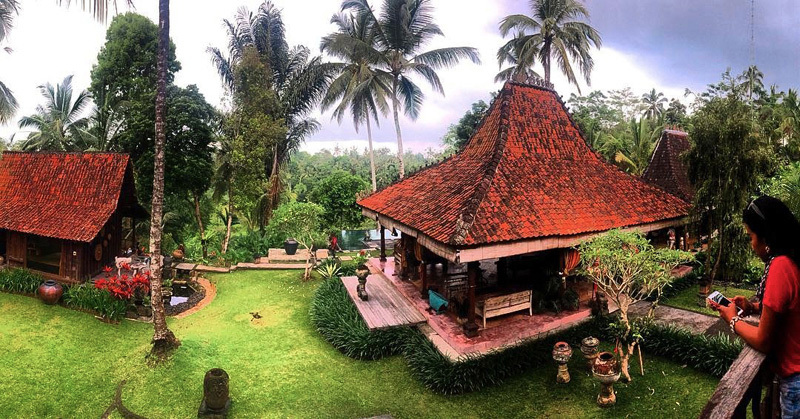 And if you’re hoping for a little daytime getaway from the hotel grounds, just sign up for a tour of Besakih – the Mother Temple of Bali! 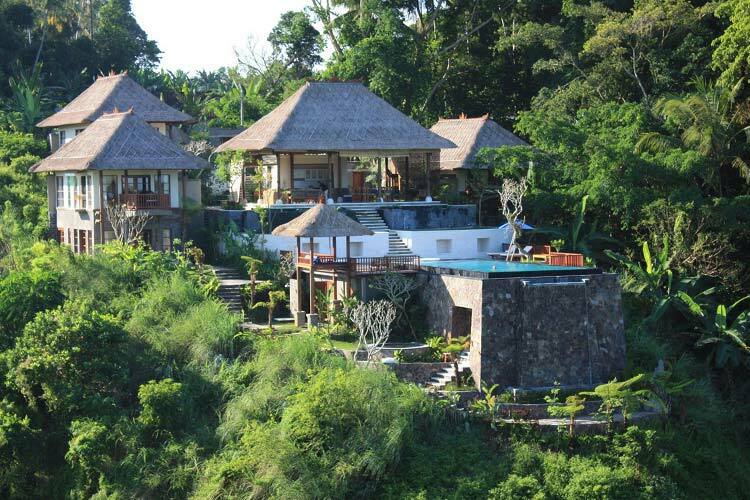 Bambu Indah may have one of the greatest villas above water in Bali, but that’s not all to it. Or do a Tarzan swing across the natural pool! There are eight different themed houses, and each is more beautiful than the next – the pictures say it all. Deciding where to stay will be a blissful dilemma indeed! 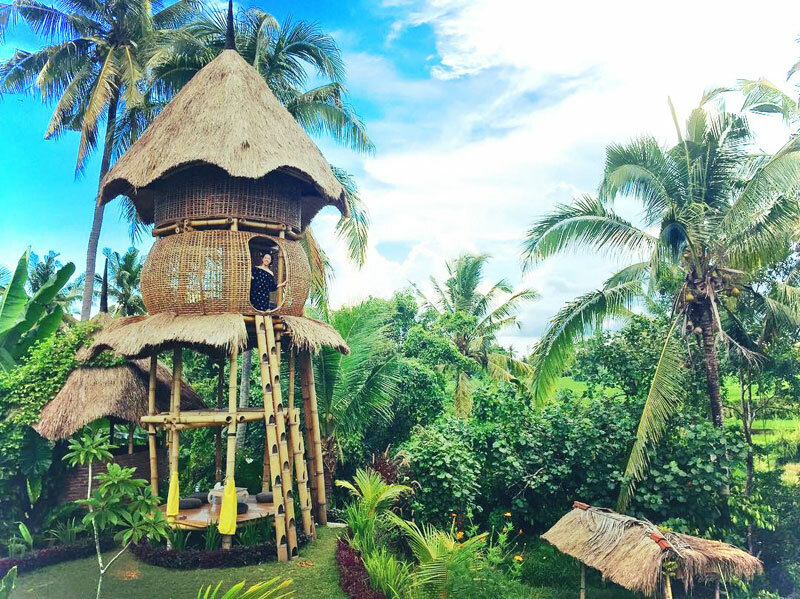 Have you ever wanted to stay in a treehouse? 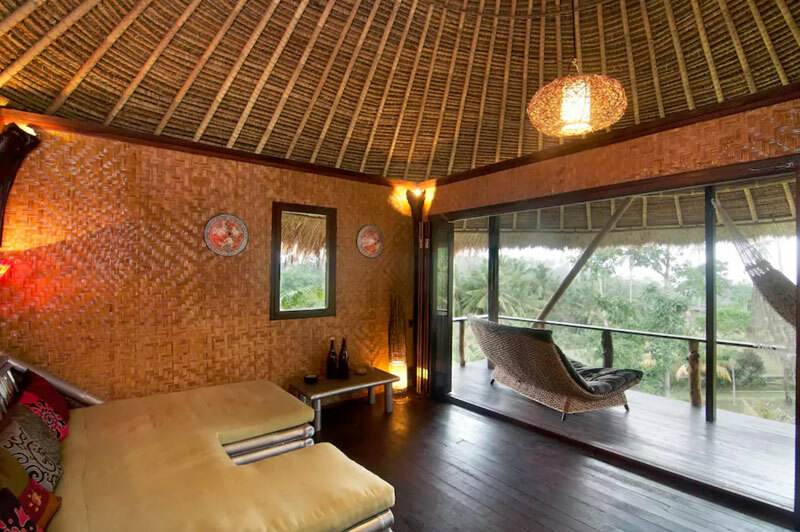 The Firefly Eco Lodge will satisfy the adventurer in you, with its thatched roof, rustic jungle atmosphere, and even high-up rooms that require you to climb into! 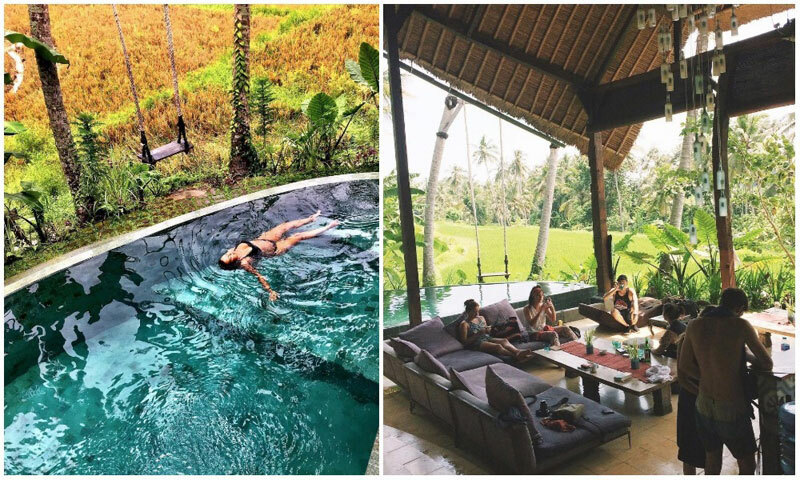 For Instagram lovers, be sure to get a cute picture of yourself on the big swing, from which you can get a gorgeous panoramic view – beautiful rice paddies of the most stunning emerald green. 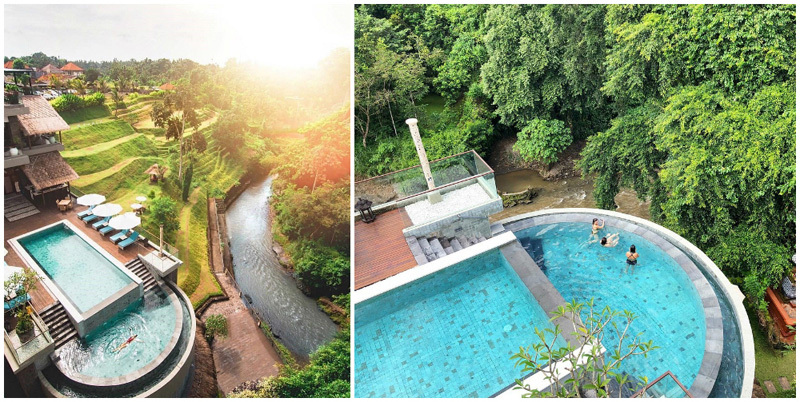 And you’d never believe that this hidden gem is only 10 minutes from the bustling Ubud centre! 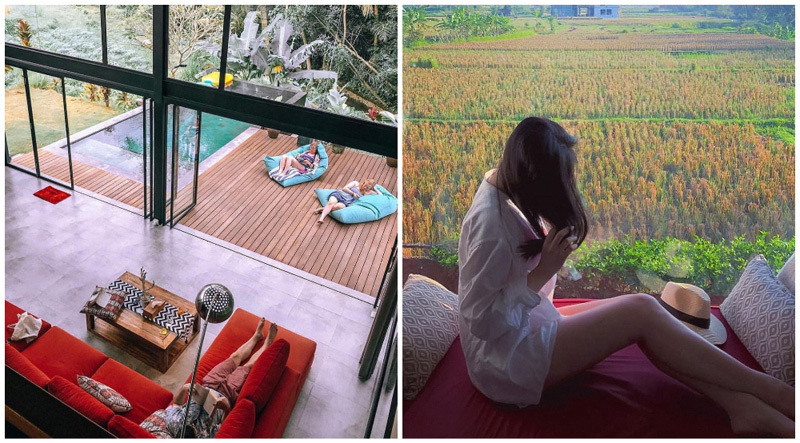 So for a perfect unity of urban and wild, you can spend your mornings lounging among the greenery, before taking a refreshing walk and end up in the heart of Ubud, where you can do your shopping and check out the restaurants and bars. 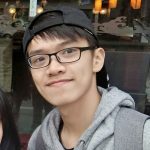 Come home at night (and it really will feel as though you are coming home!) 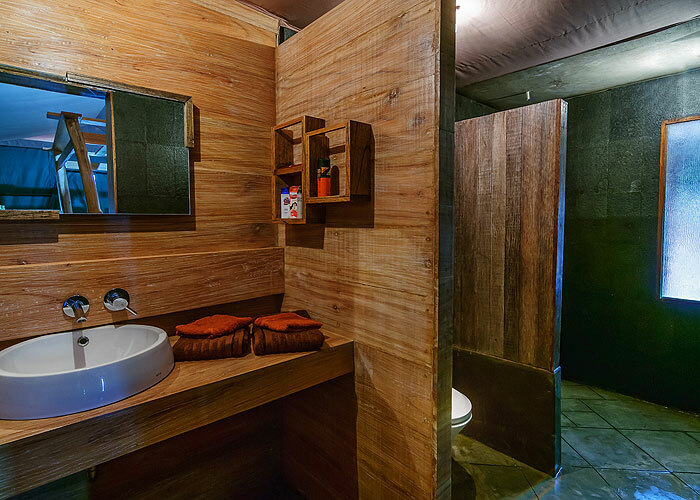 and rinse the day away in the open-air shower, as you close your eyes and feel the water’s spray under the starry Bali skies. 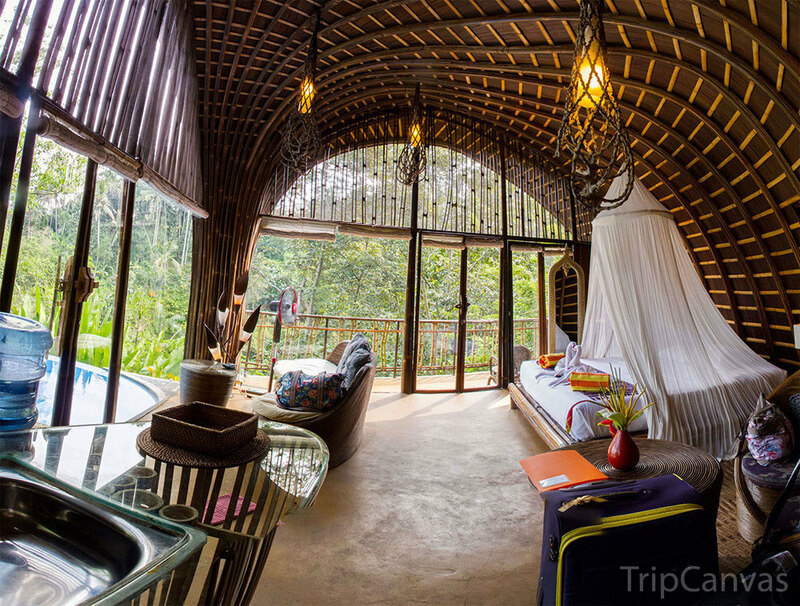 How can you not fall in love with this beautiful and unique jungle stay? 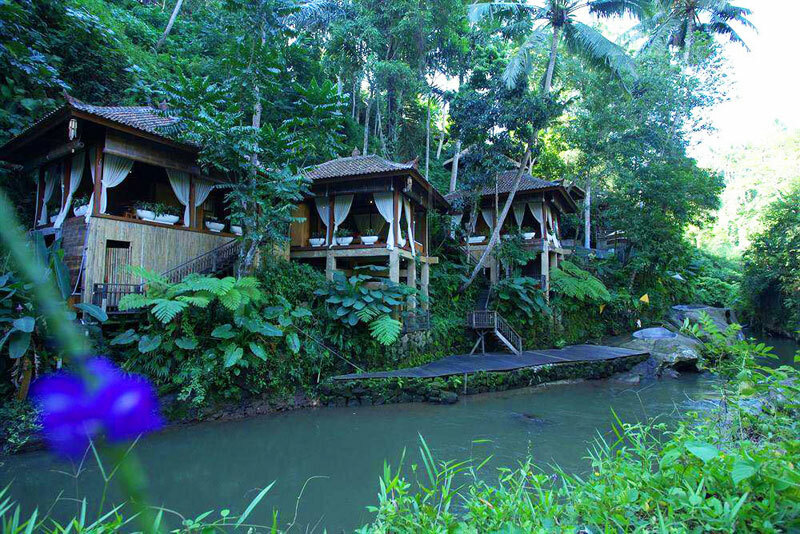 In a traditional Balinese village, about 20 minutes from the centre of Ubud, lies a secret Zen Hideaway. 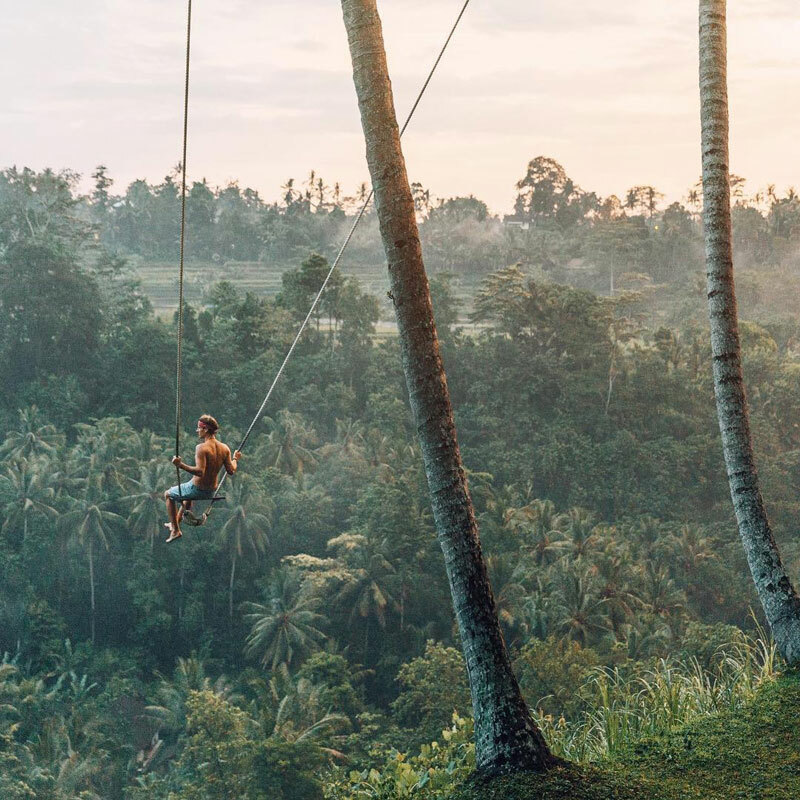 And here’s the highlight of this tucked-away paradise – you can swing out to the monumental rainforest view from the coconut trees! 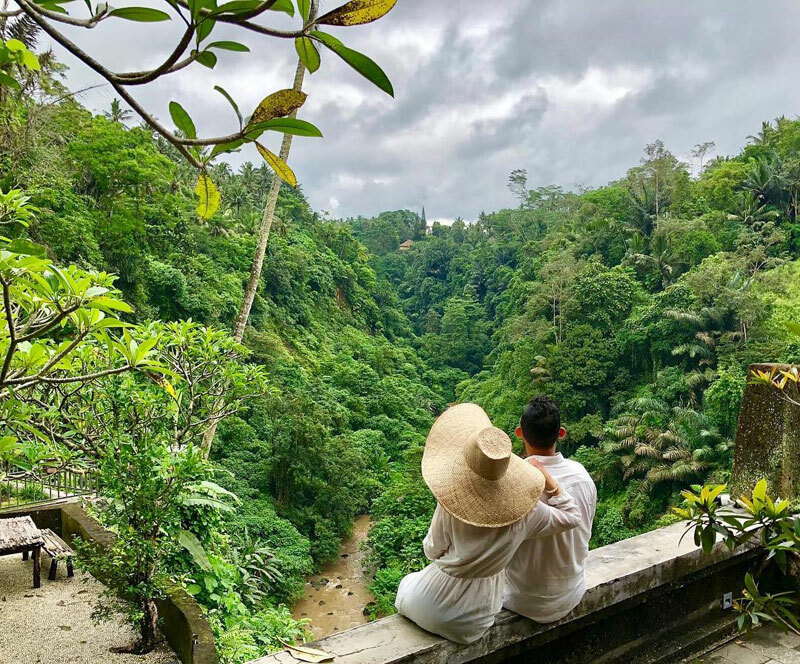 As far as the eye can see, you can take in the Ayung river, the valley, a huge waterfall, rice paddies and the majestic Mount Agung – all in front of you. 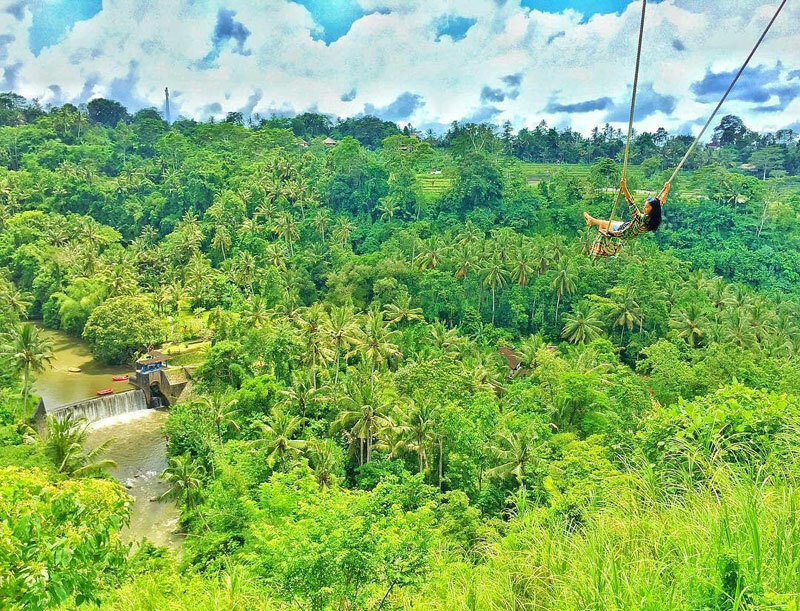 Both thrilling and addictive, this may be one of the ultimate swing rides of your life. 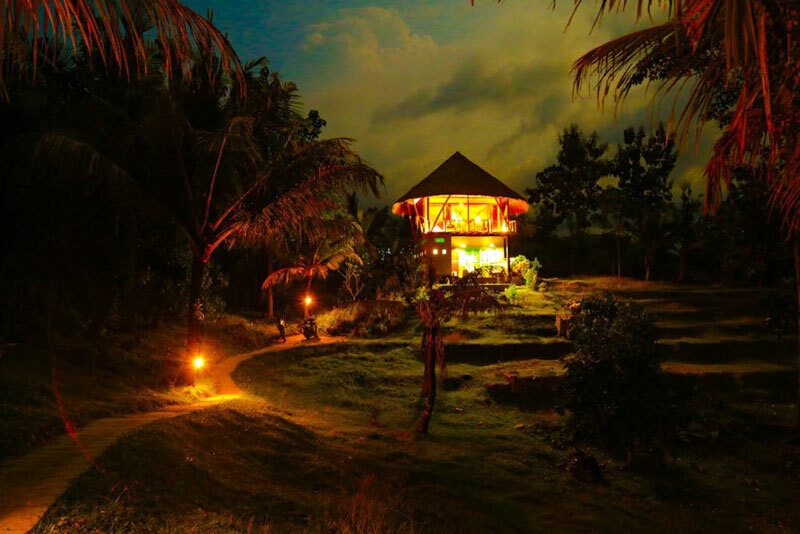 The property is made from 150-year-old teak wood and designed by a Japanese zen master, Zen Hideaway is a place for those looking for serenity and peace – writers, contemplators, yogis, thinkers readers, relaxers or simply anyone who needs to escape their busy, stressful everyday life. 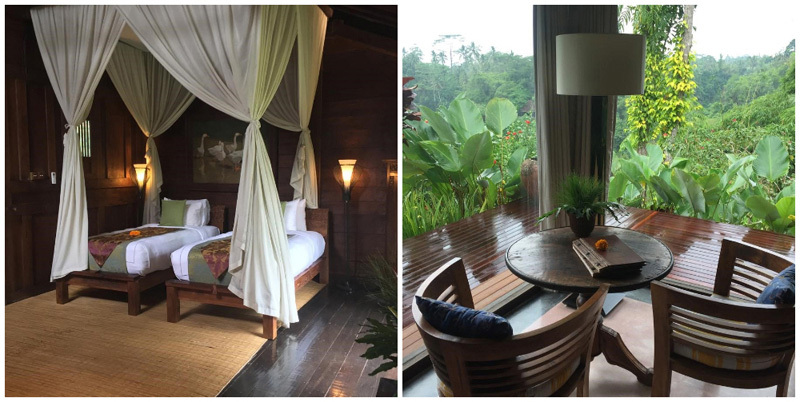 The rooms are of semi-open concept, so you can have a hearty dose of fresh Ubud countryside air. 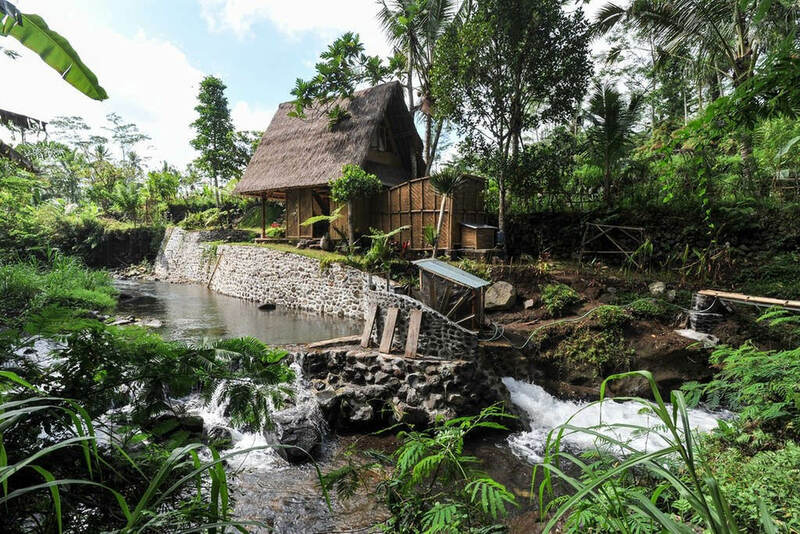 From the house, you can walk along a small trail to the river or waterfall for a relaxing swim. 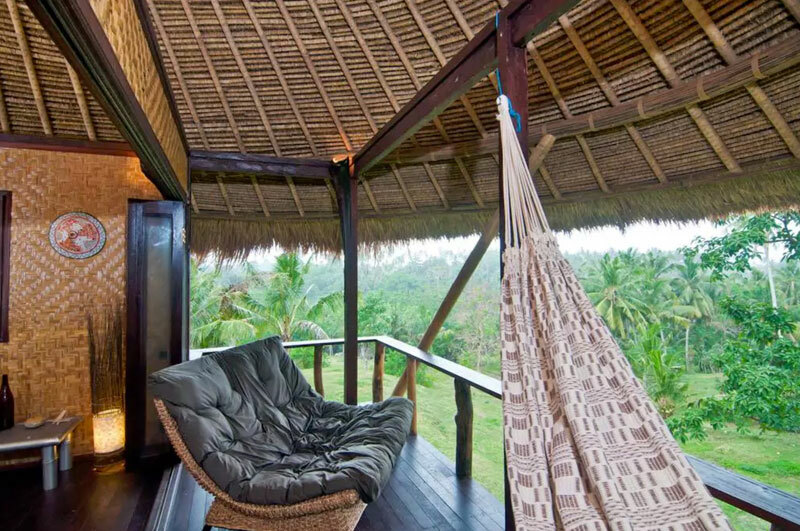 Or you can simply laze the day away and read your favourite book in a hammock! And since this is in a local village, you can interact with the locals if you’d like to experience the authentic daily activities, such as farming, dancing or traditional ceremonies (if available while you’re here). 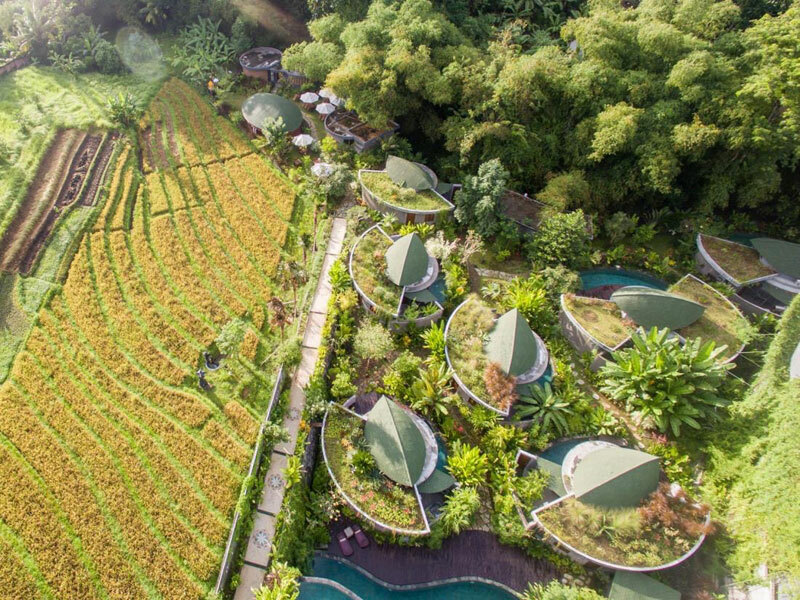 These unique villas with leaf-shaped roofs are built in a landscape garden, equipped with recycled furniture, and will provide you with maximal comfort. 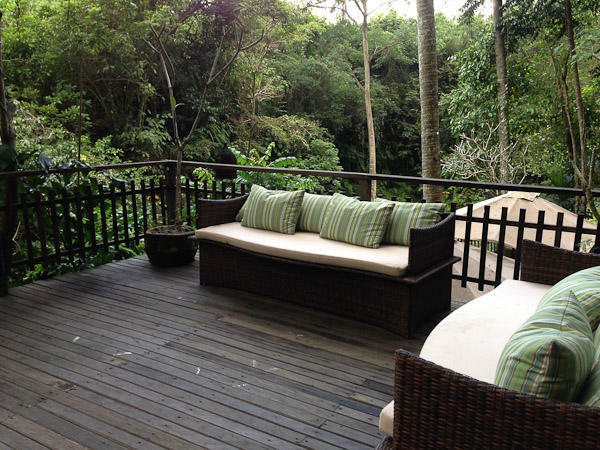 Surrounded by nature, you can enjoy the beautiful view of the forest throughout your stay. 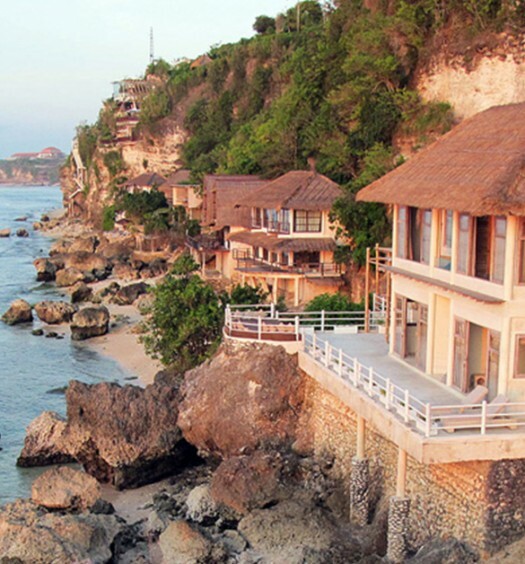 De Moksha Resort is located near Tanah Lot temple, one of Bali’s top location where you can watch the sunset. If you choose the three-bedroom villa, you will have an access to a private saltwater swimming pool, BBQ grill pit and even a personal butler. Their two-bedroom and one-bedroom villas offer private plunge pools and direct access to the communal pool from your room! 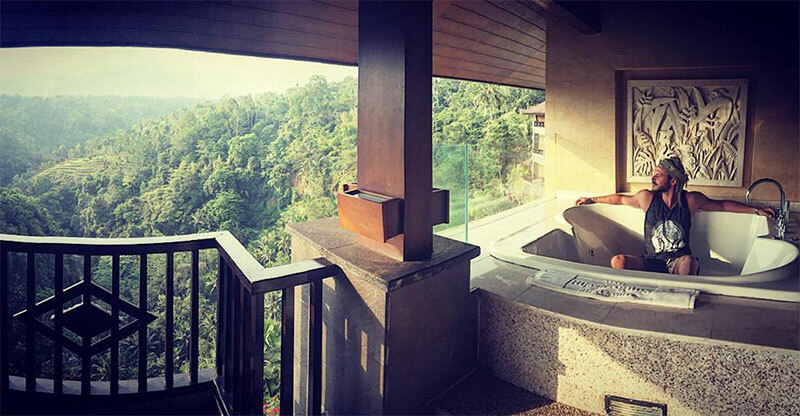 Each villa has a stone-made open air bathroom. Just imagine having a bath under the night sky! 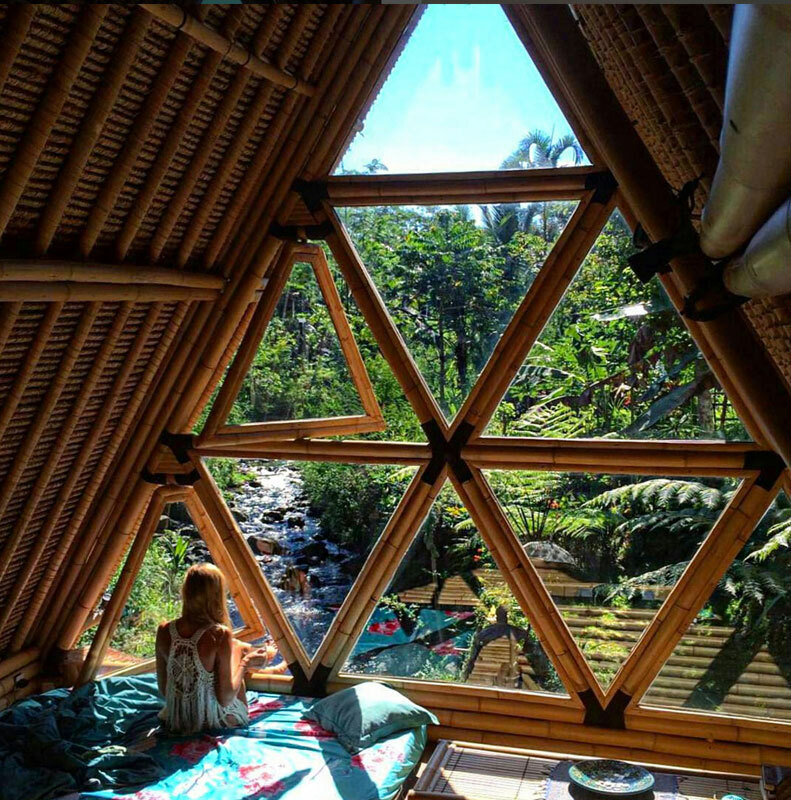 All yogis will also fall in love with the open air, leaf-shaped yoga shala. 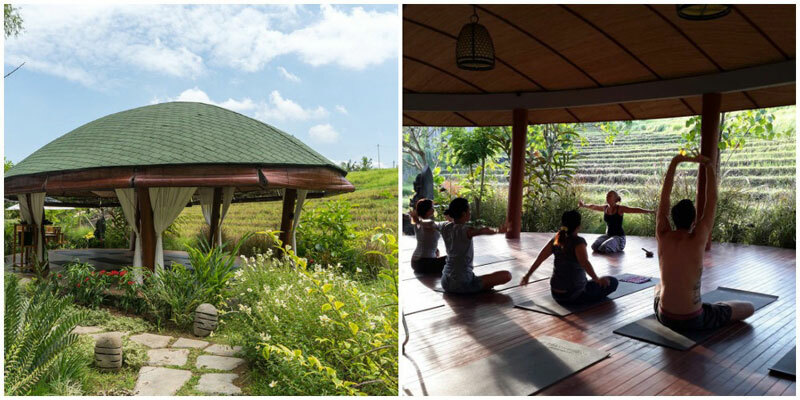 What can be more beautiful than doing yoga while being surrounded by gorgeous rice fields? 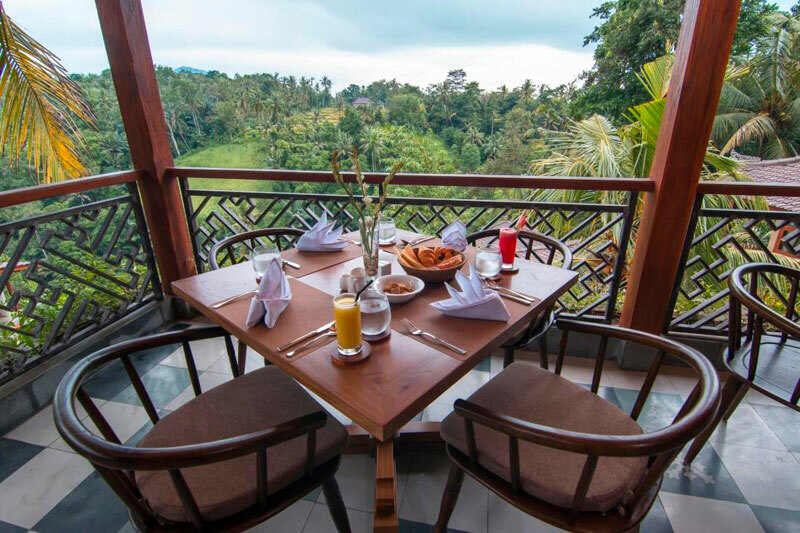 From the veranda overlooking the huge garden and palm trees, you can watch the sunrise in the morning, and enjoy the view of the ocean. And you can even pick your own coconuts here! 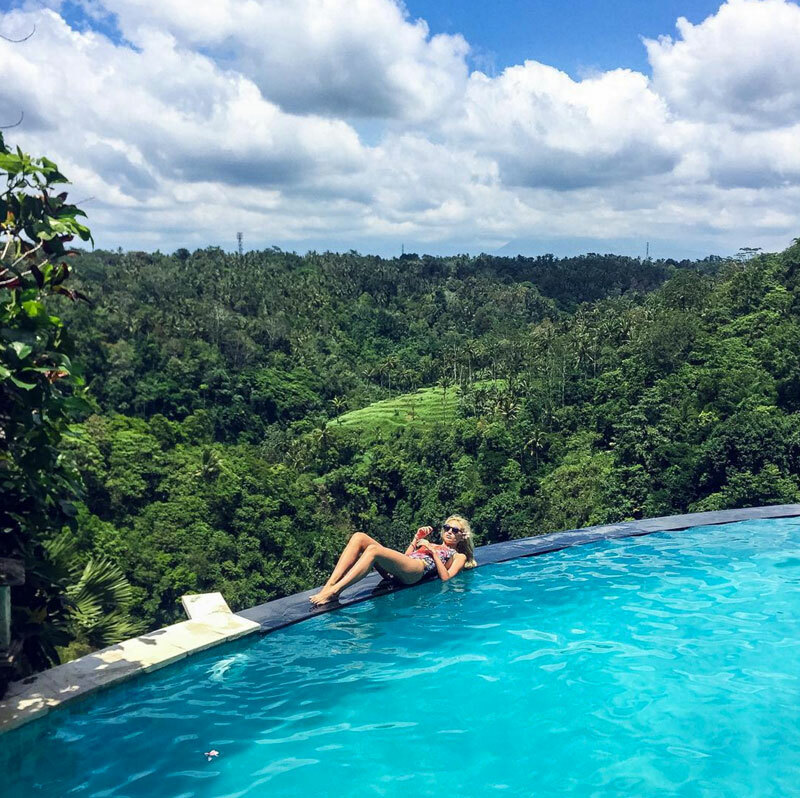 If you’ve never swum in an infinity pool on a hillside, you should most definitely escape to the magnificent Rijasa Agung Resort. 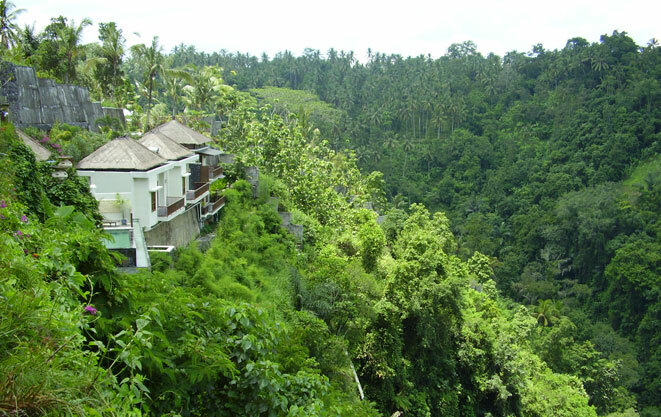 The resort is built on a dense mountainous hillside in Ubud, with 42 spacious rooms overlooking the stunning Ayung River. Here, you will only find tranquility and peace. 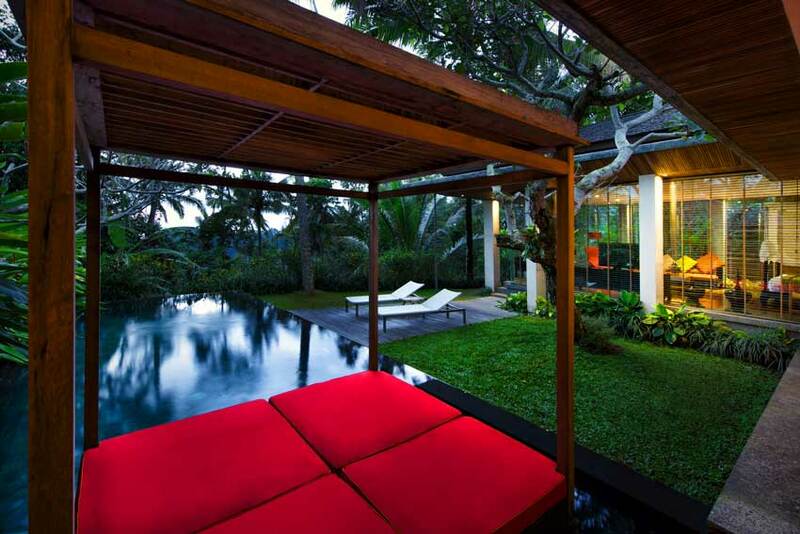 It’s a luxurious sanctuary that puts you in touch with your inner self as you indulge in its natural surroundings. This exquisite resort also offers a wide array of facilities and a two-level restaurant that serves local and international culinary delights. 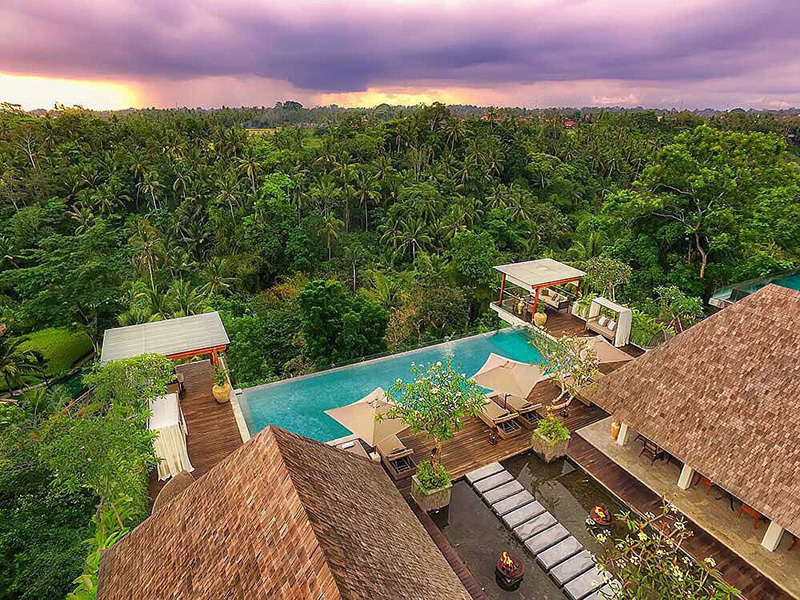 Overlooking the beautiful Petanu river valley,Villa Awang Awang offers every indulgence to glorious jungle living in the traditional Balinese village of Melayang. 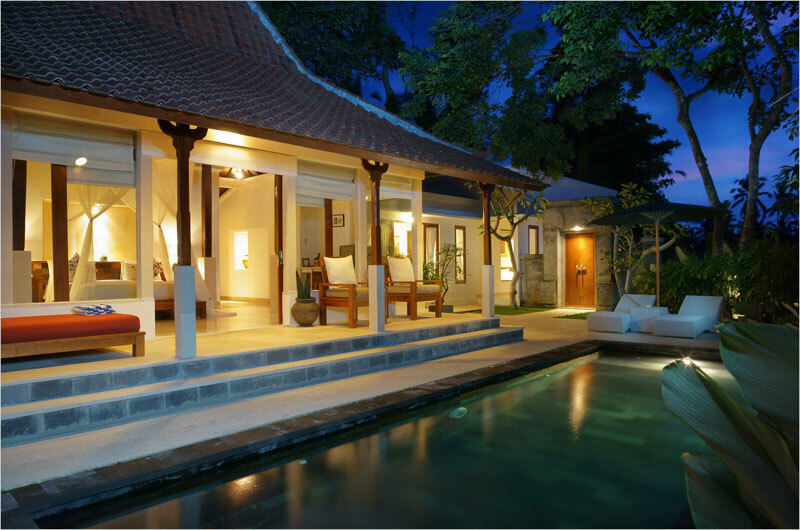 Its villas are of traditional Balinese and Javanese design, and are created from local and recycled materials. How much more eco-friendliness can you find? Each villa also has a strong focus on the embrace of nature, featuring open plan spaces, garden bathrooms and stunning views. 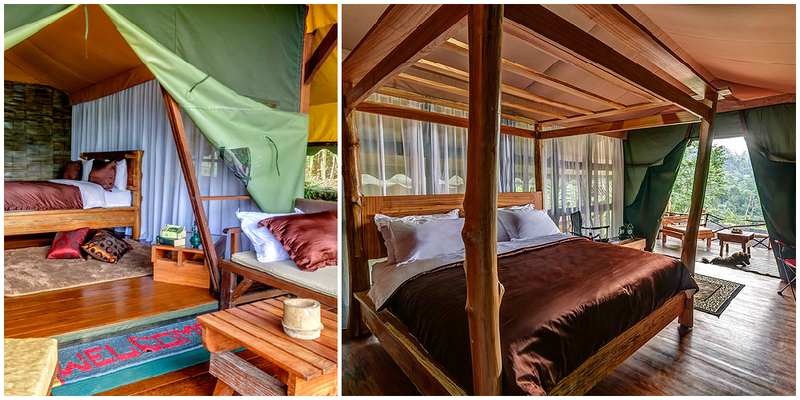 Ever slept in a luxurious tent in a rainforest? 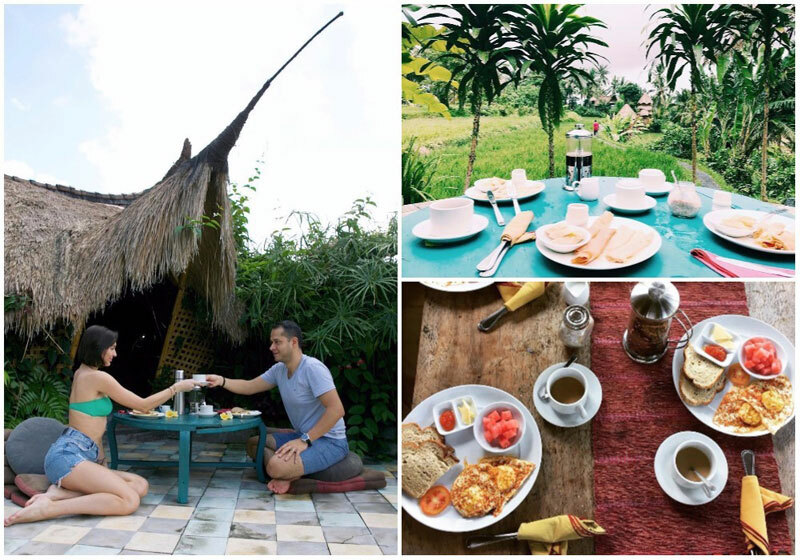 If you are keen for something off-the-beaten-path, give Sang Giri Mountain Tent Resort a try. 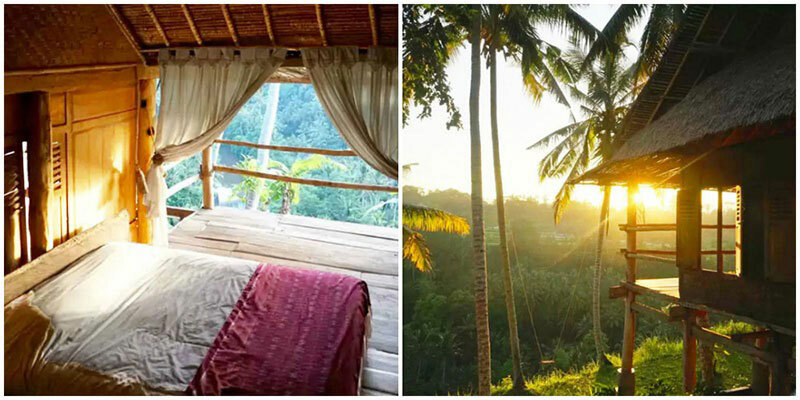 Nestled in the mountains of Jatiluwih, in Tabanan, Sang Giri offers eight deluxe tents where you can watch the sunrise peeking over the jungles’ treetops from your very own private terrace. 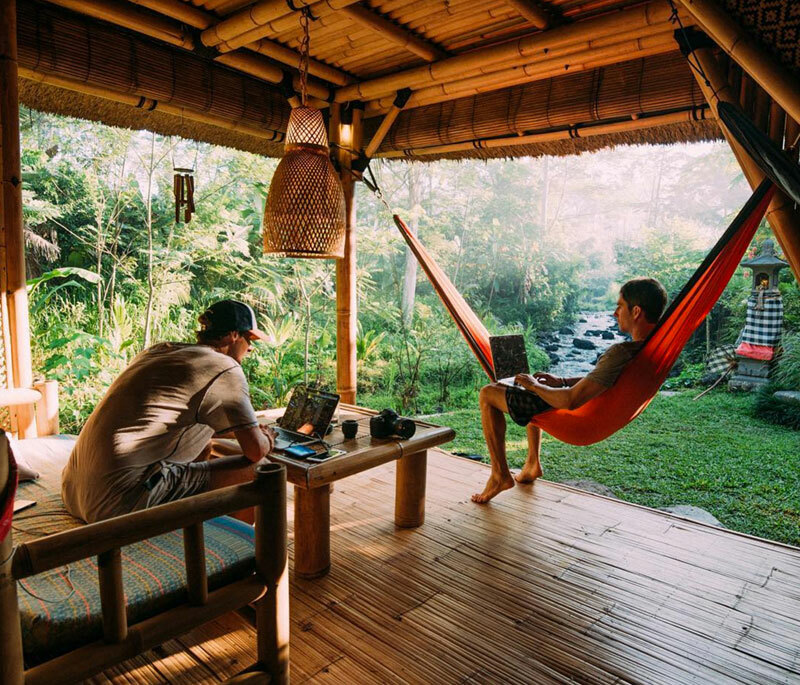 If you’re feeling restless and itching for some adventure, why not trek into the rainforest, bird watch, mountain bike along the available trails or explore the nearby terraced paddy fields? And the best way to unwind after all those activities? Jump into the hot spring bath or soak in the resort’s sauna. 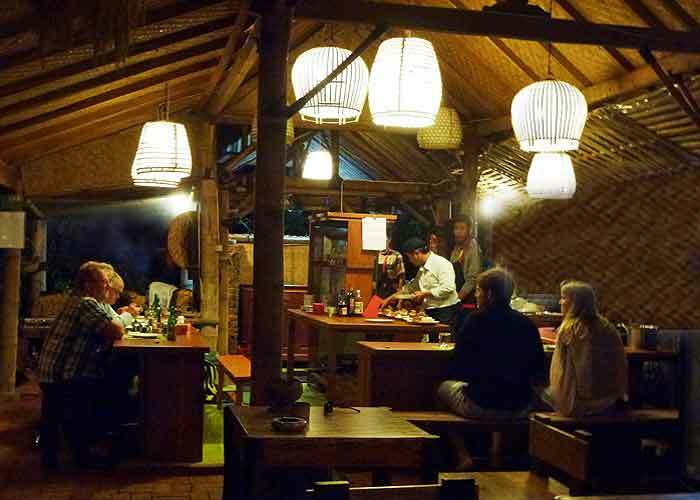 Sang Giri also offers a traditional-style open restaurant where you can watch chefs at work and your dishes being prepared. You can even customize the dishes to your own liking too! 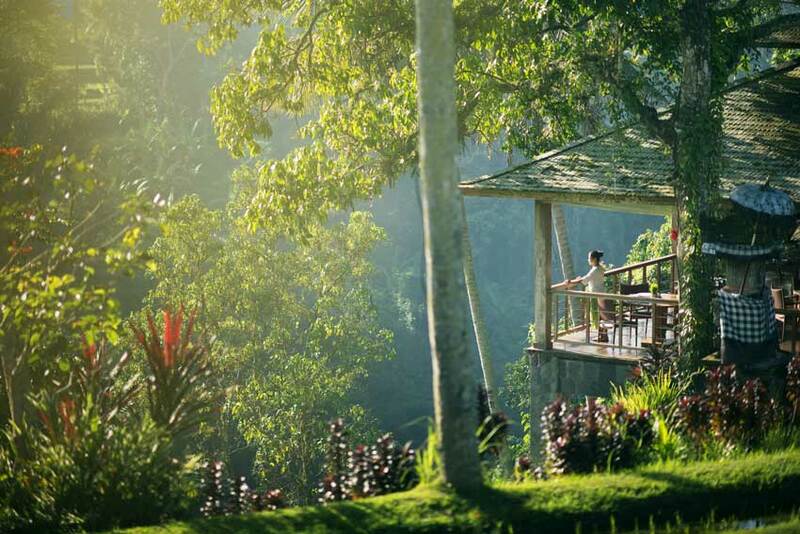 You won’t find a jungle getaway anywhere in Bali like the Menjangan Resort. 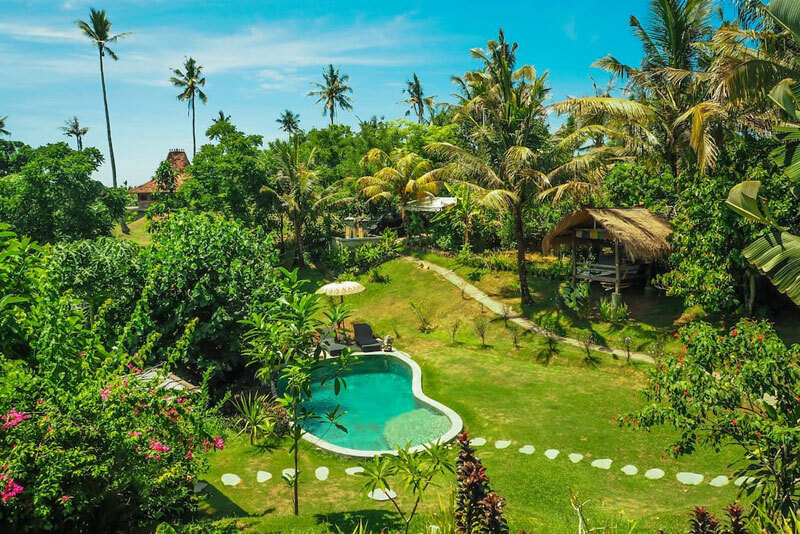 It’s right in the middle of the Bali Barat National Park, amidst 382 hectares of beautiful untouched rainforest, and located on one of Bali’s most stunning coastlines. 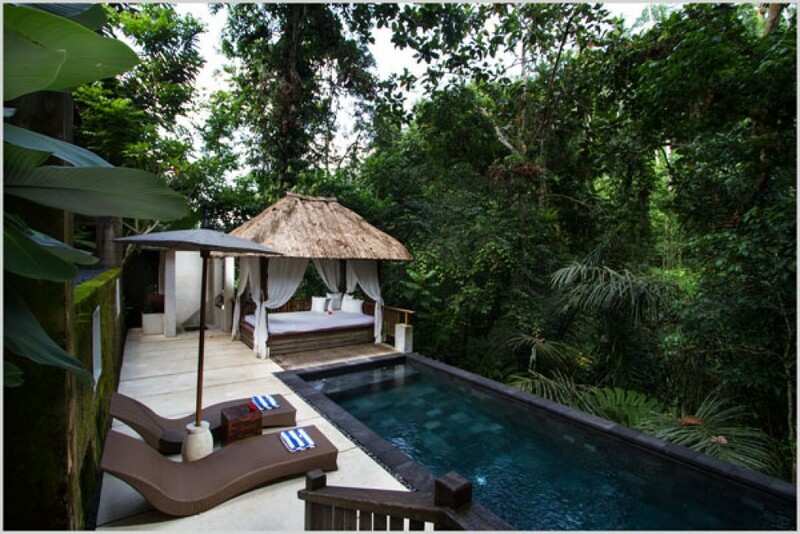 You get to choose from rooms or suites in the main residence surrounded by greenery, or a private rainforest villa on the beach. Yes, the resort walks the line between jungle and coast perfectly! While you’re there, you can enjoy a range of eco-friendly activities, such as bird watching and snorkeling off the coast of this leafy paradise. When you enter the sacred land of Svarga Loka Resort, feel the pressures of modern life melt away. Instead, surrender yourself to the beauty of nature and the journey of rejuvenation. 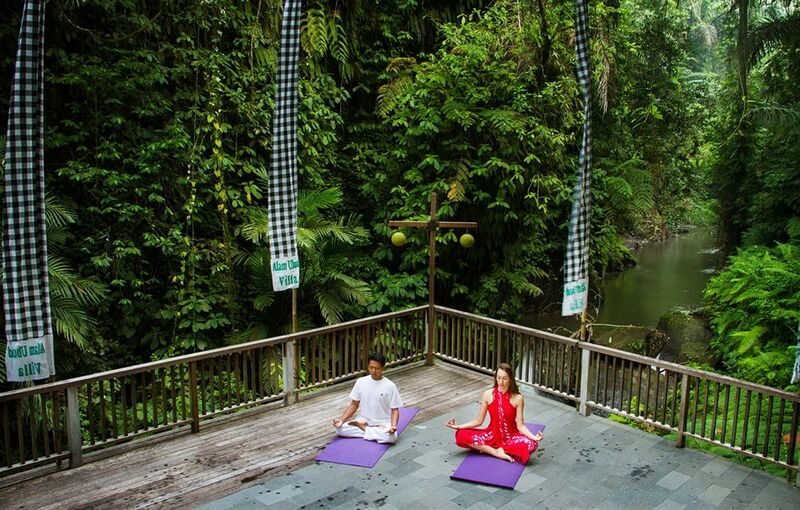 Sitting on the riverbanks of Campuhan river in Ubud, the resort offers a wide range of luxury accommodation as well as facilities for wellness and healing therapies. 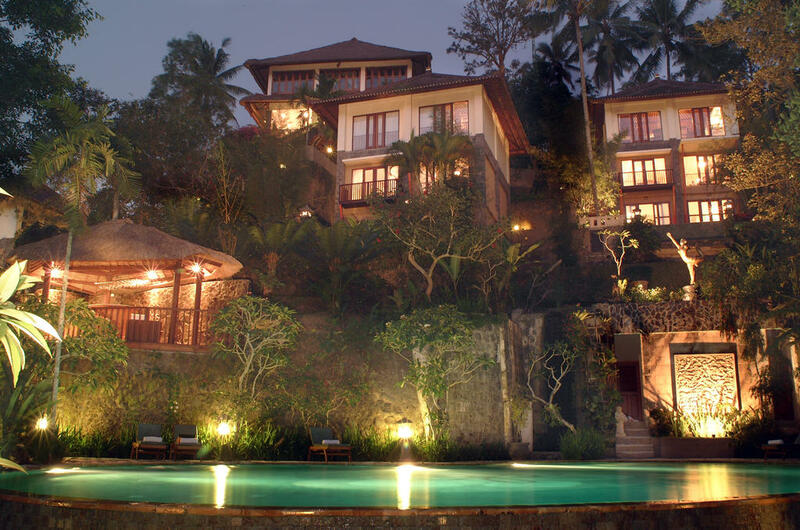 Rooms in this resort are fully air-conditioned and they each feature a terrace overlooking a lush garden. 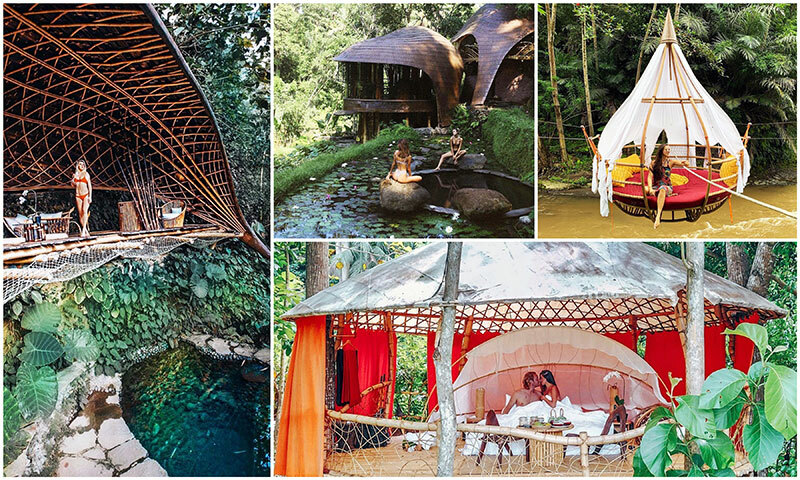 You can do yoga by the riverbank or meditate in an elevated outdoor pavilion – perfect for some quiet reflection. 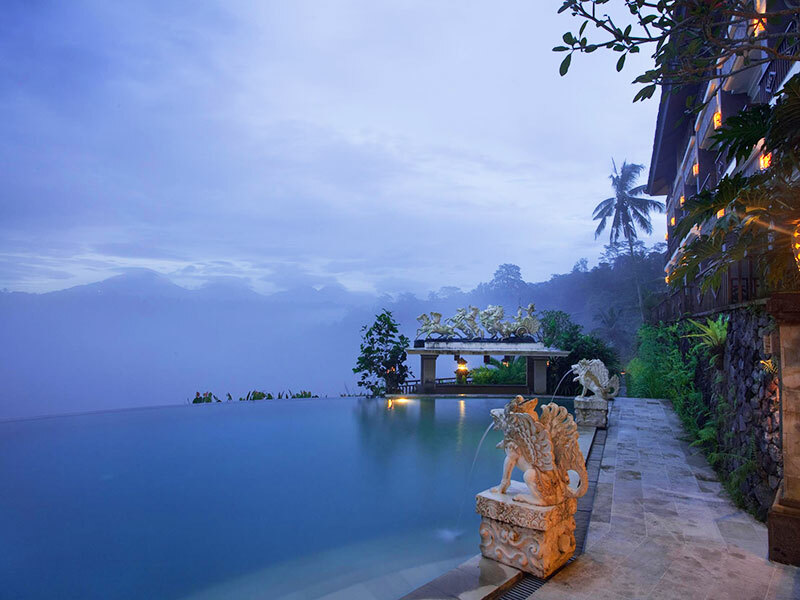 So if you’re looking to seek mental clarity and peace, Svarga Loka Resort is your place. The best part? All hotel guests can enjoy complimentary wellness, arts and crafts and cooking lessons. 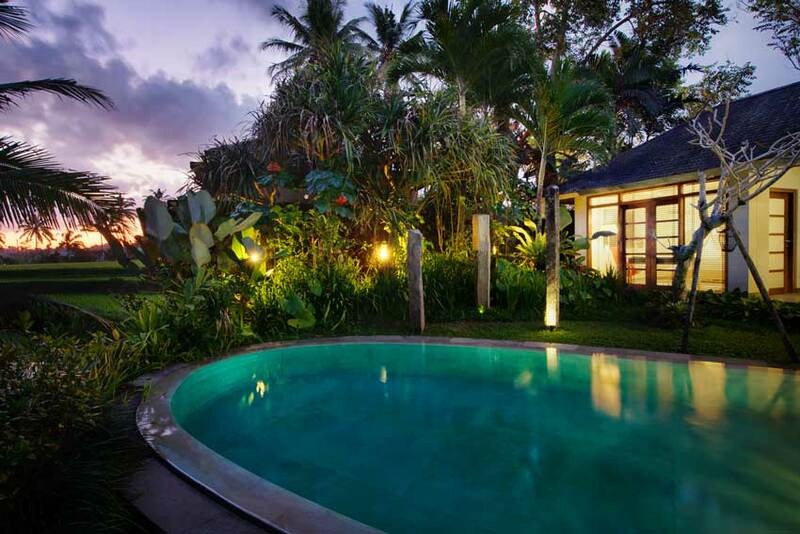 Prepare yourself to enjoy a slice of paradise at Chapung Se Bali Resort. 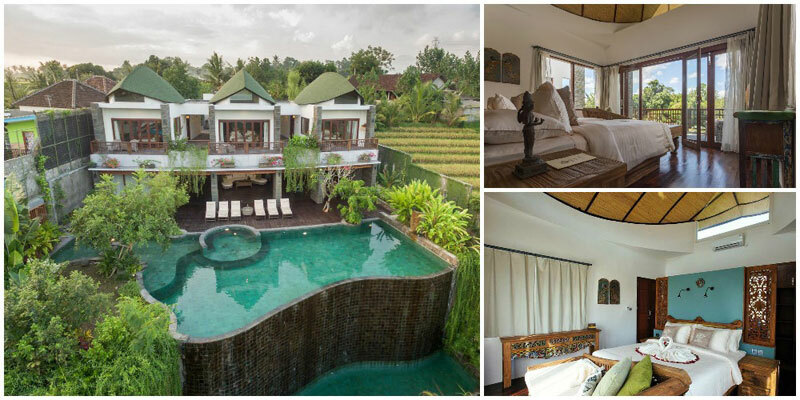 Situated in Ubud, there’s eight stunning luxury villas within the property that will offer you a delightful getaway from the hustle and bustle of the city. Here, you get to soak up the sun on a sun lounger, breathe in the fresh air and listen to the sounds of nature – the best therapy to work fatigue. When evening comes, be sure to enjoy a relaxing bath under the stars! And the next day, you can look forward to an amazing breakfast spread at the Chapung’s restaurant. The views there are to-die-for! 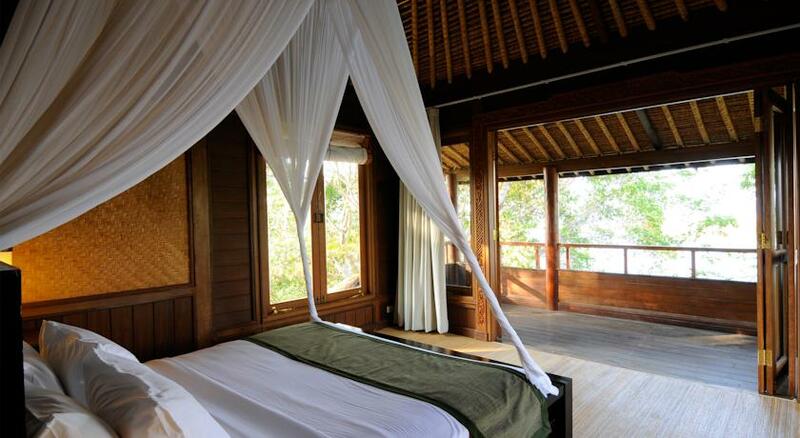 Near Petanu River, surrounded by the dense tropical rainforest, lies Anahata Villas & Spa Resort. 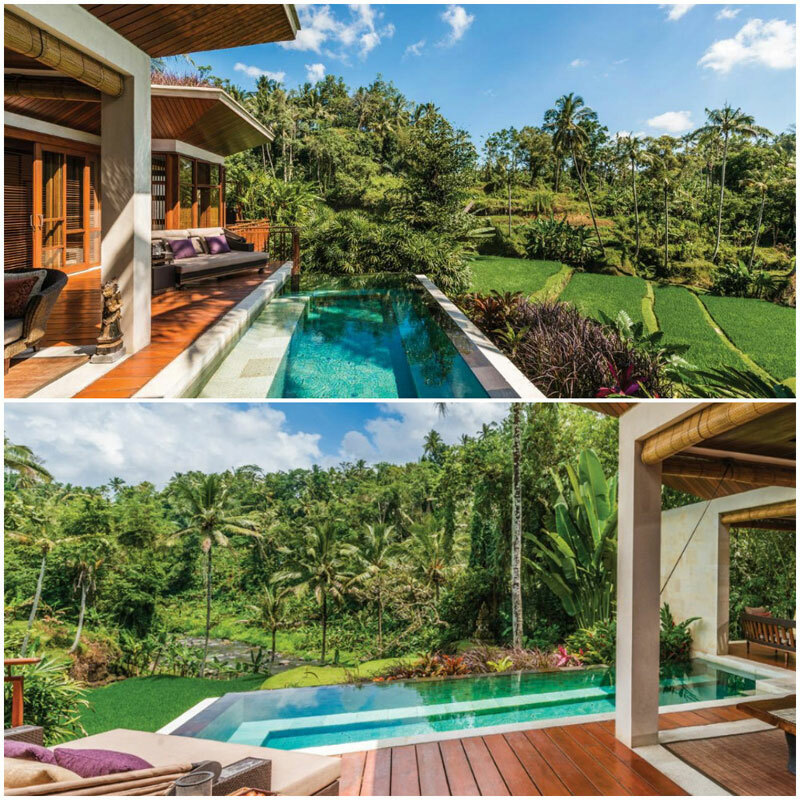 Built with a vision to offer a natural retreat for your mind, body and soul, Anahata offers 12 exquisite villas for you and your loved ones. 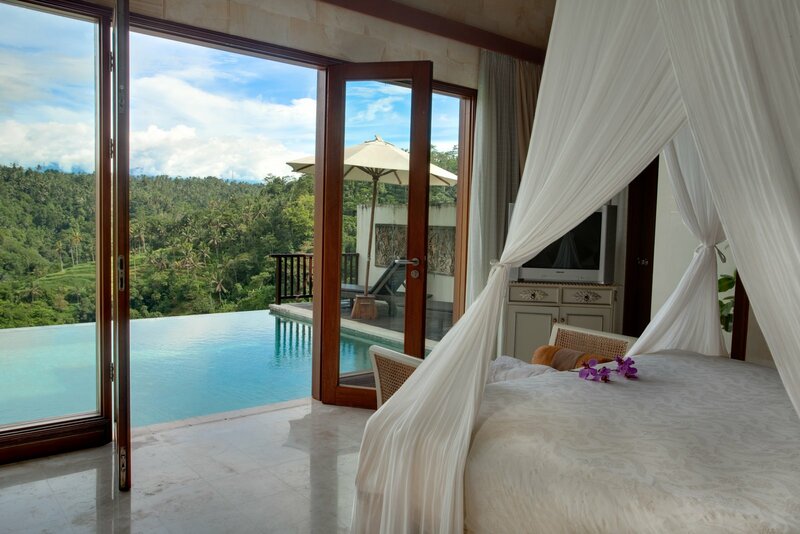 Every villa comes with a magnificent panorama and a private plunge pool. If you want to do a good workout, you can use the resort’s larger swimming pool. 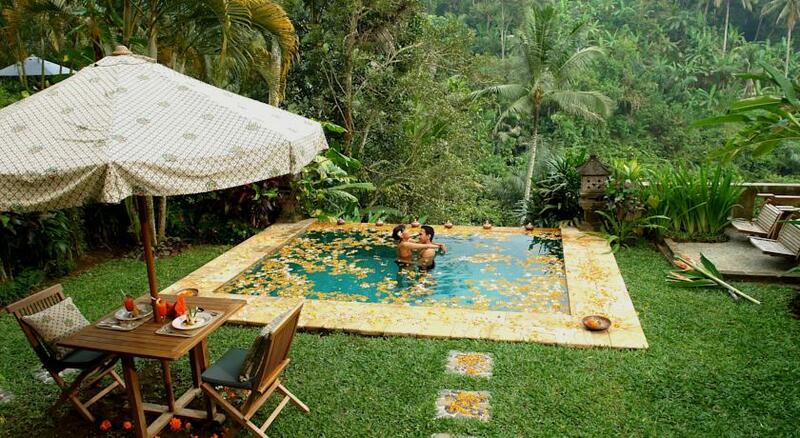 This is not just a place for couples on a honeymoon. 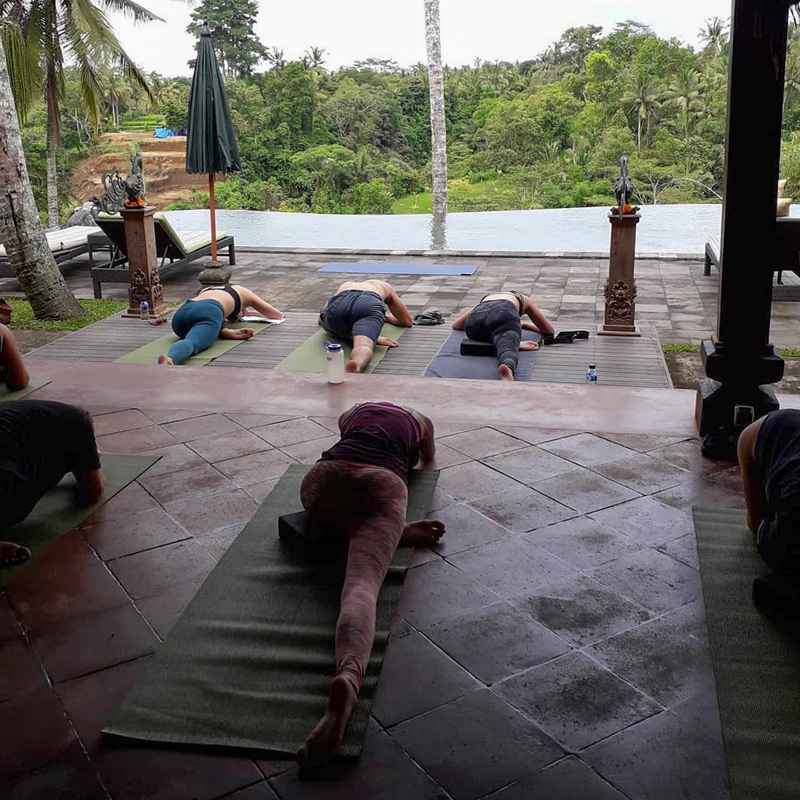 Families with children will also enjoy Anahata as there are plenty of activities and facilities for everyone. 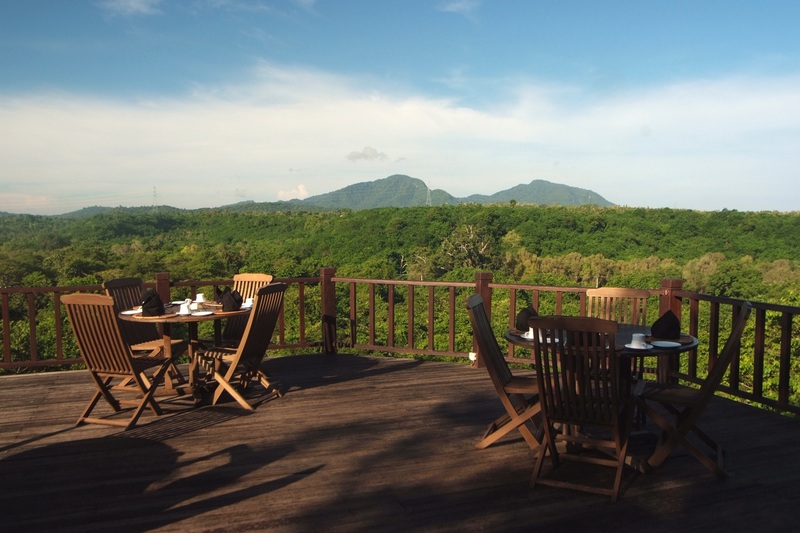 The Resort also offers a Bar and Lounge where you can get a drink and enjoy the view of lush greenery. Live music is sometimes available too! 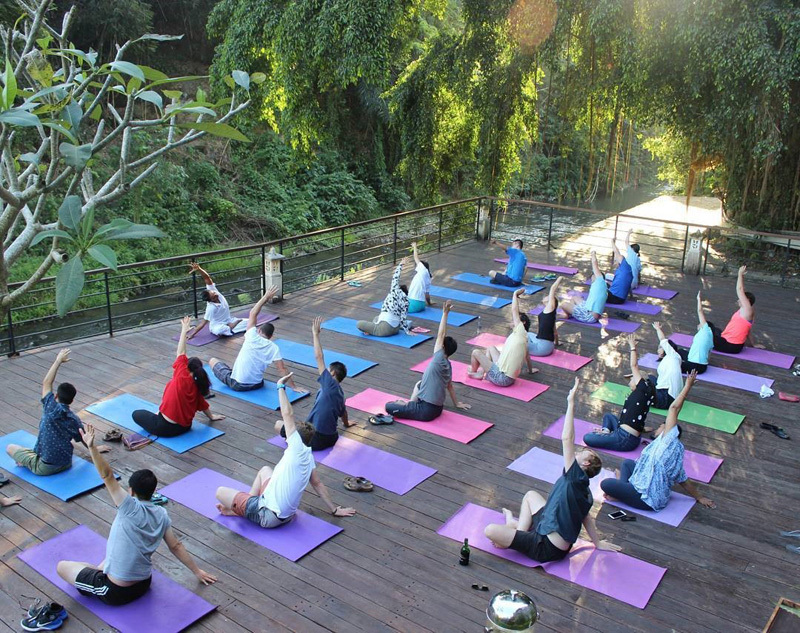 What’s more, yoga classes are offered free on weekends to all guests. 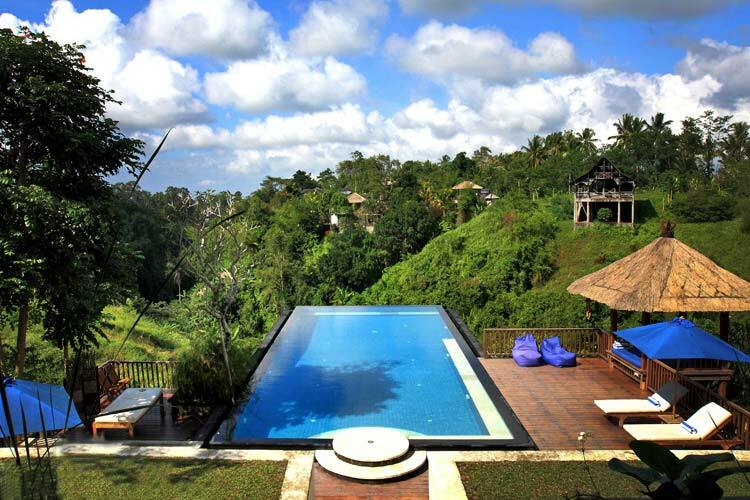 Amori Villa is an exclusive boutique resort that offers uninterrupted views over the Petanu River valley. Here, you can fall asleep to the melody of the rustling river, catch the flitting butterflies and dragonflies, and let your eyes rest on only nature and nothing else. Comprising of five types of residential suites and a one-bedroom villa, at Amori, you may start your day with a morning swim in the 14-metre infinity pool or take a stroll through the villages, followed by a healthy breakfast. Your afternoon may include a luxuriating massage and pre-dinner cocktails while you watch the dusk fall. 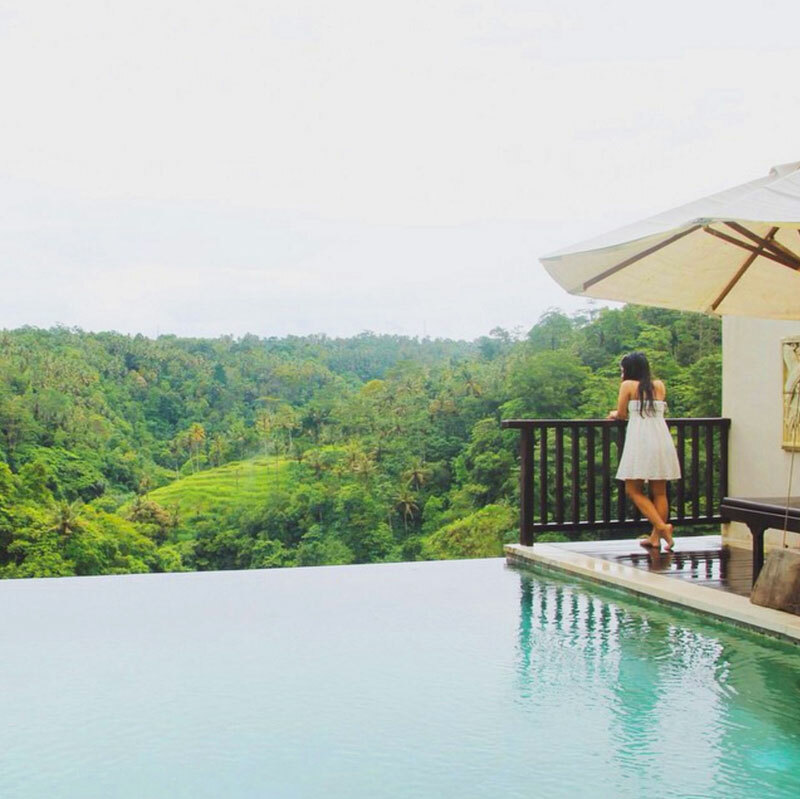 Nestled secretly within the valley and surrounded by the tropical forest, Alam Ubud is a resort that took more than pure effort to build. It’s said that around 70,000 of local craftsmen, painters, sculptors and artisans were mobilised to design and build the villas. 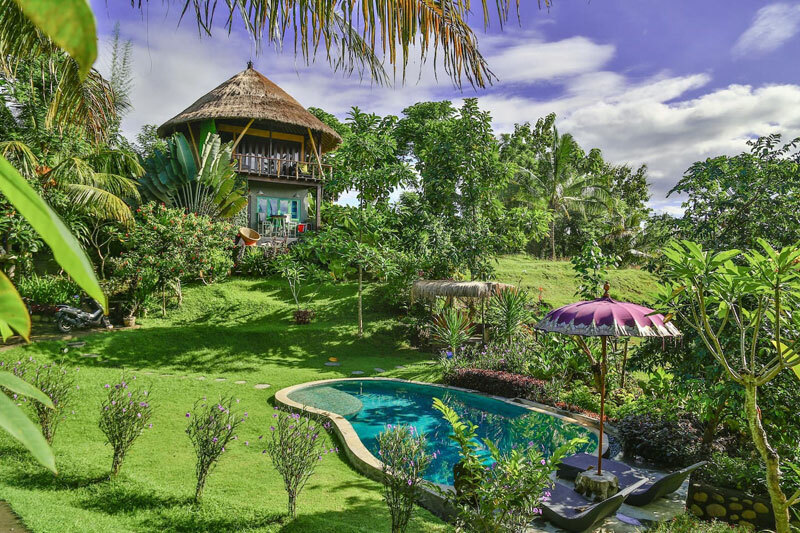 Perched atop wooden pillars and hugging the rugged hillsides, these beautiful villas give you stunning panoramic views of the gorgeous green landscape. Listen to the hush melody of nature and experience a sense of calm within. 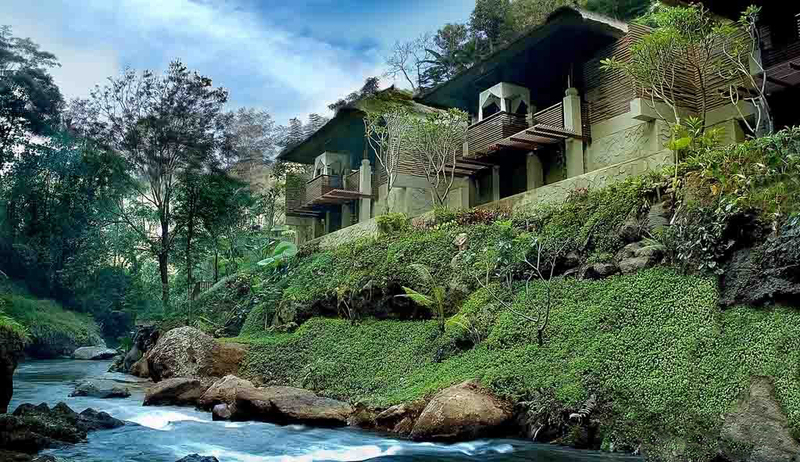 This jungle jewel is nestled deep in the lush rainforest, where the sounds of the river will serenade your stay – perfect for those of you who are looking for a healing retreat. 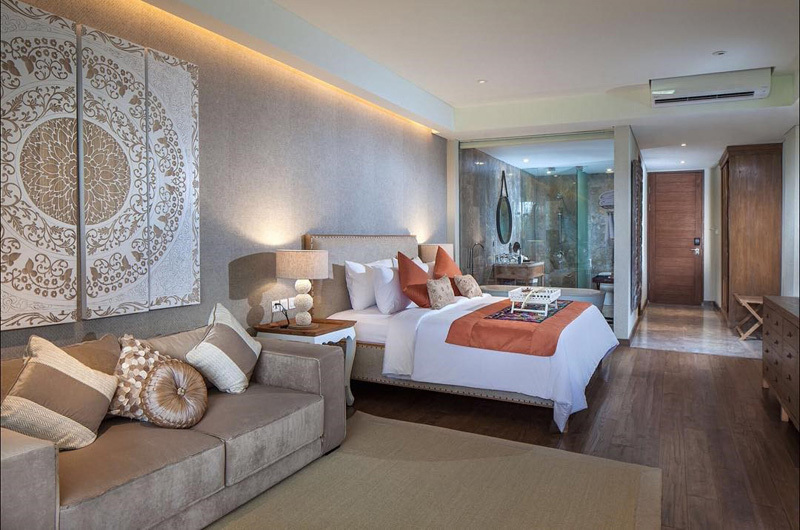 The Riverview Two-Bedroom Villa at Four Seasons Sayan is a luxuriously spacious option, making this a perfect choice if you’re travelling in a group, with the whole family, or simply on a double date. 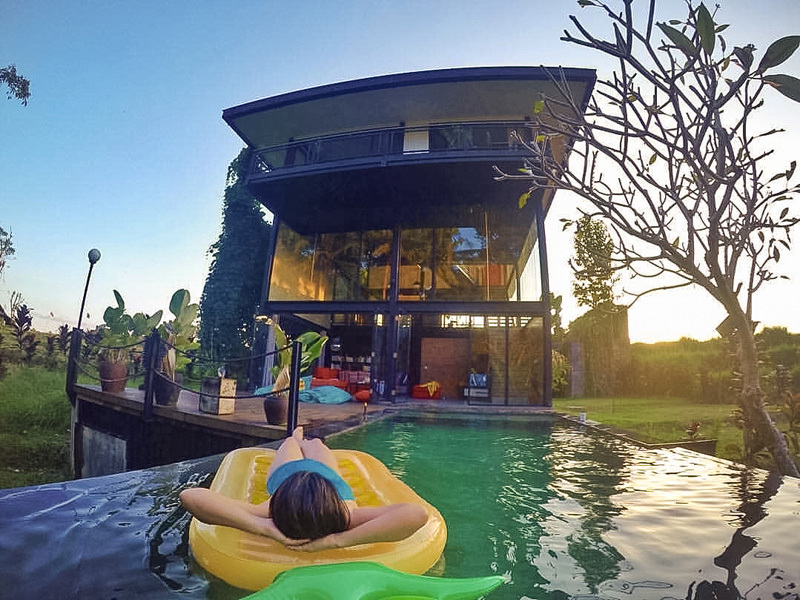 This stunning villa boasts of a personal lily pond, a private meditation area, and peaceful, relaxing views of nearby rice paddies and the Ayung River as it gently whispers past. Tucked away in quiet greenery, this is a wonderful spot for a private dinner, or even just for lounging. 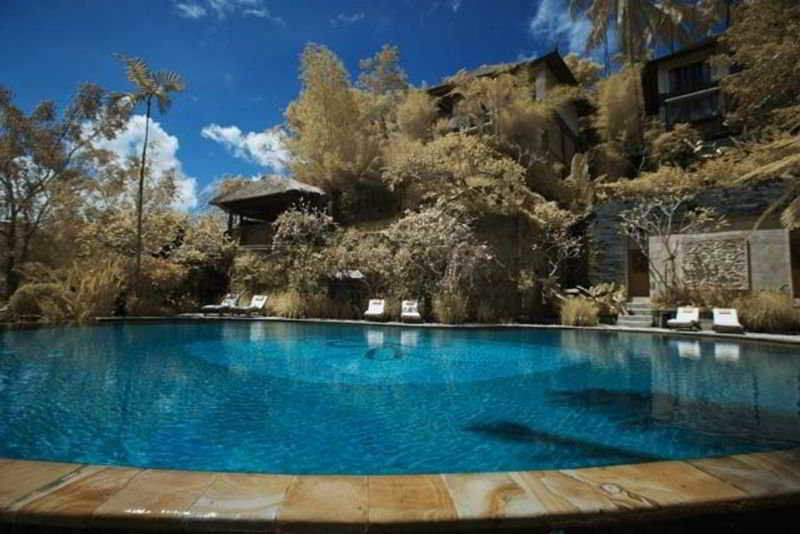 You can spend the afternoon floating in your private plunge pool! If you are coming with your partner, the Riverfront One-Bedroom Villa would be a perfect option. You’ll love to cuddle up close under the sheer white overhead bed canopy, and take advantage of the sumptuous outdoor shower and freestanding stone tub! 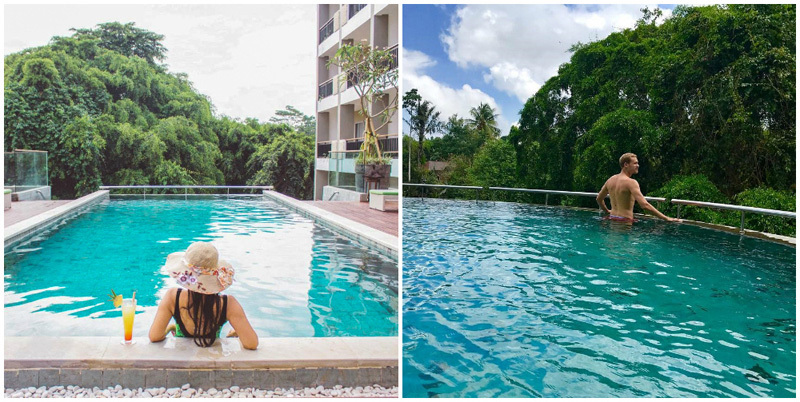 Don’t forget to take some iconic pictures at the resort’s main infinity pool, which overlooks the entire horizon. And when it’s time for dinner, simply drop by the Ayung Terrace or Riverside Café, where you can dine and unwind right beside the gentle river. 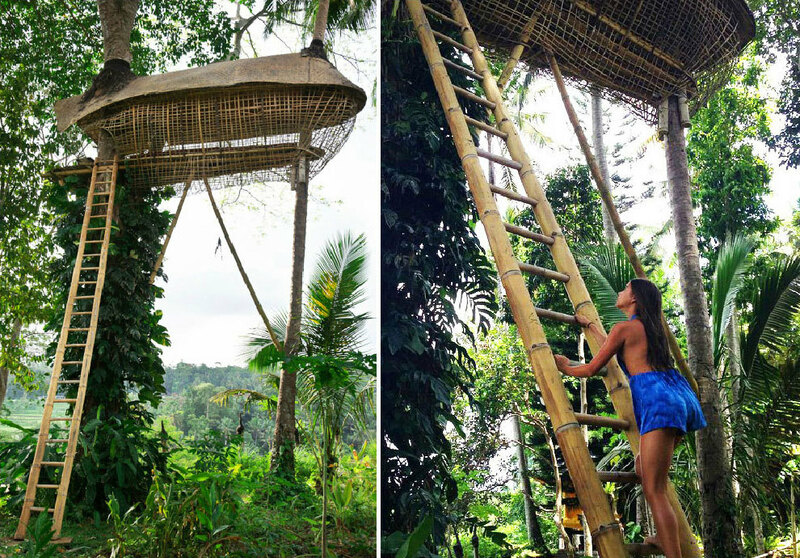 For a very different (and immersive) Ubud experience, we recommend trying the resort’s ‘Day in the Life’ activity, which allows you to experience life as a Balinese farmer for a day. 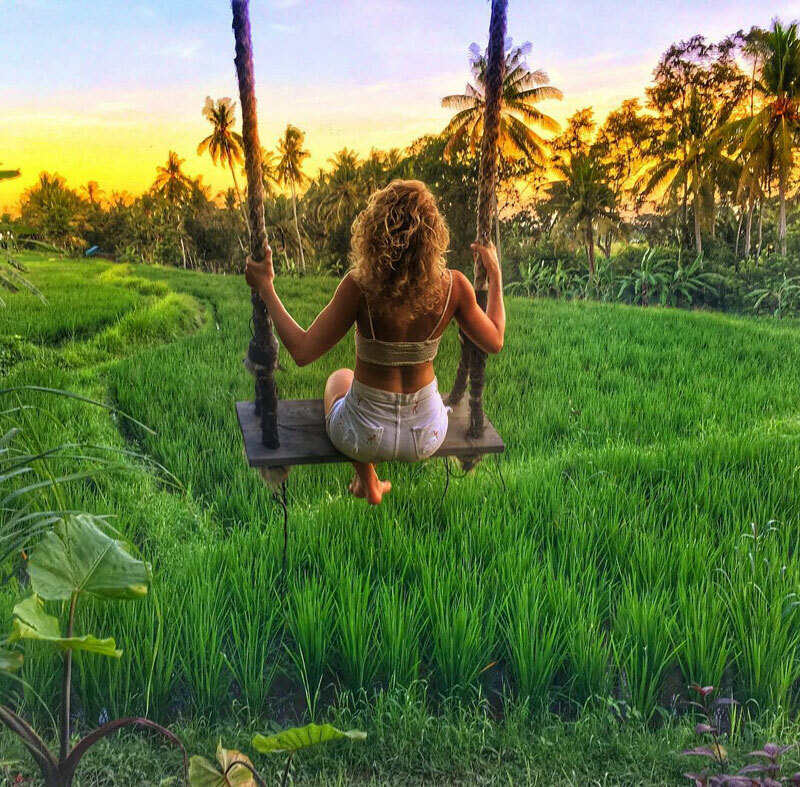 The experience includes a guided walk through rice paddies and jungle pathways, and helps the local farmers with rice planting – an enriching experience you’ll treasure for a lifetime. P.S. Distinguished guests at Four Seasons Sayan include former US president Barack Obama, who was here for a family vacation in 2017! We’d completely understand if you opted to stay in this hotel forever. After all, they have almost everything here! 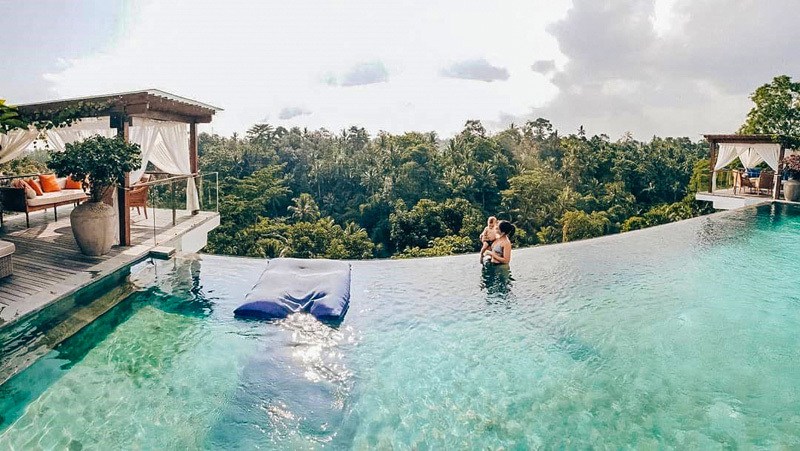 If surrounding yourself in lust tropical greenery while lounging in an infinity pool sounds like your kind of trip, this hotel is definitely the one for you. If you’re in the mood for a little night life but don’t want to stray from the hotel, throw on your cutest top and plan a little date night at the Naga Rooftop Bar for cocktails to watch the sunset and take in the sweeping views. Daytime activities are in no short supply, so if you want to plan a full day there’s tons to choose from! 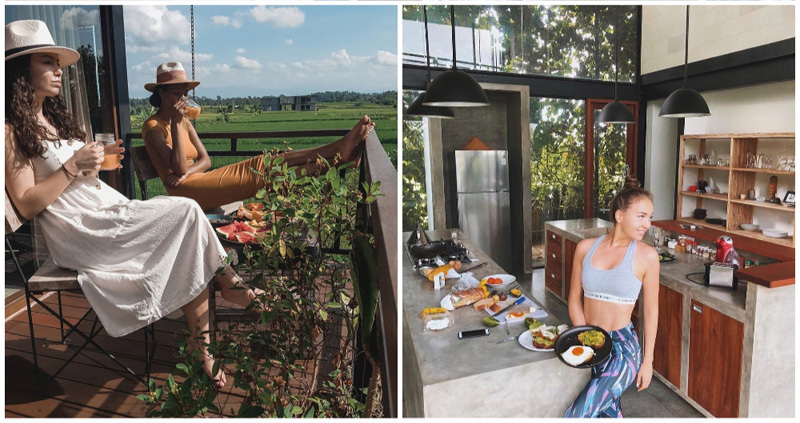 Balinese cooking classes, kite flying, and cycling tours are just a few from a long list of super fun things you can do during the day. You can also start your morning off right with a little sunrise yoga, and begin your day feeling relaxed and ready to go out on adventures! 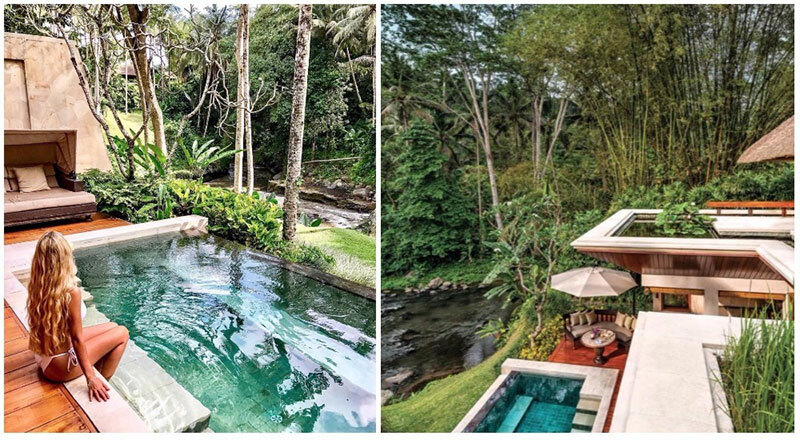 A natural haven in the middle of quiet Ubud and the Petanu River, Maya Ubud is 10 hectares of gorgeously designed land dotted with private pool villas and luxury guest houses. 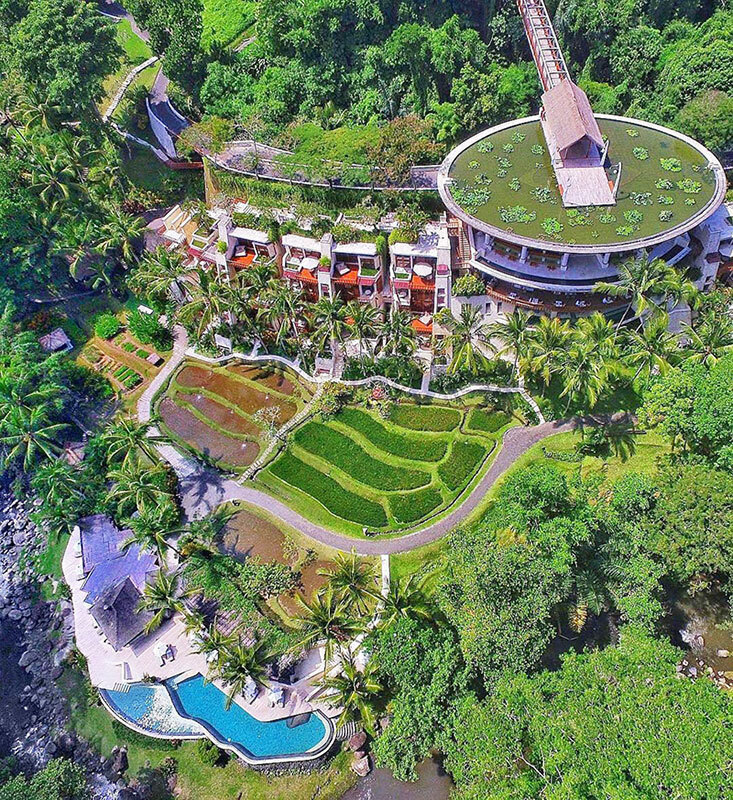 Relax in the pools adjacent to the stunning rainforest, get a massage at the spa, trek around the rice paddy fields, or start the day with a guided session of yoga in the sun. And that’s not all you can enjoy at the resort. Its restaurant boasts of sumptuous local and Western meals, and you can even continue your workout routine at a quality fitness centre or the tennis court. 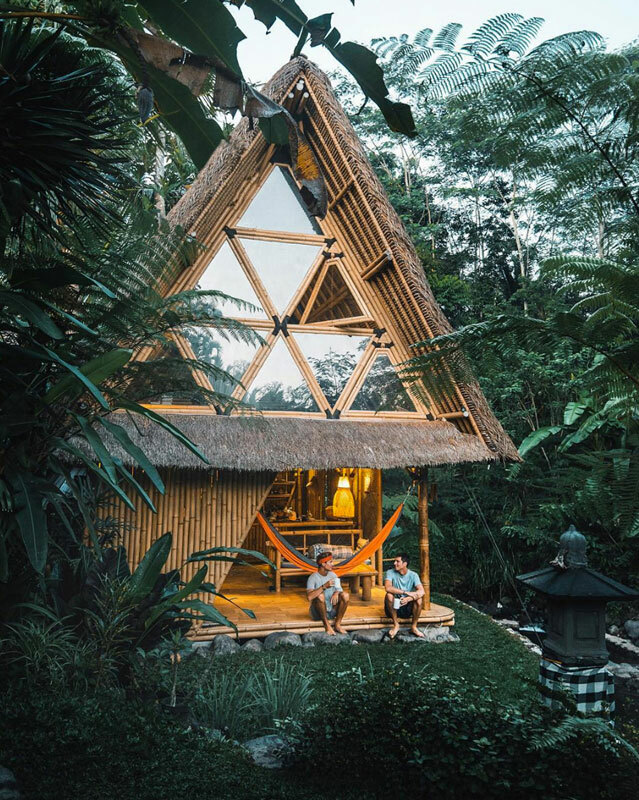 If you want to simply disconnect from the world and indulge in absolute peace amidst nature, there’s no better place than this secret hidden gem in the lush jungle of Bali. 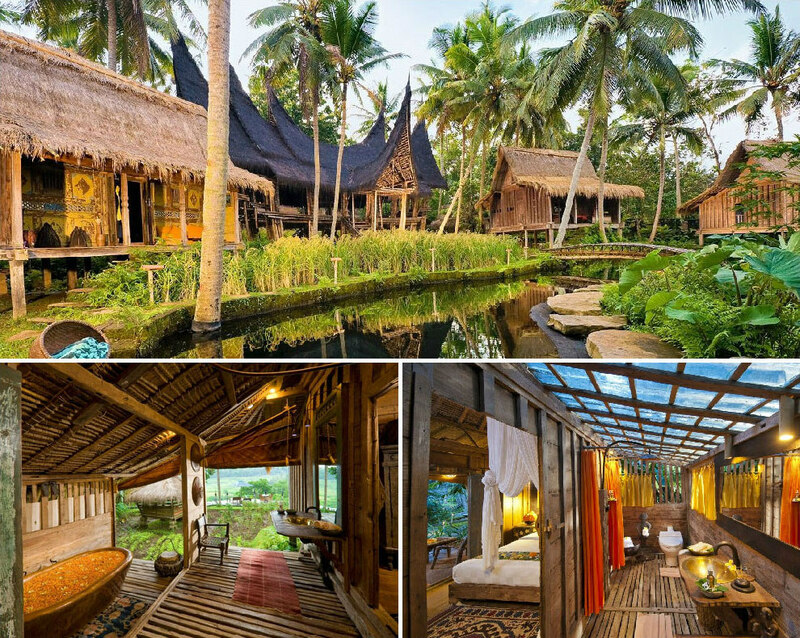 Villa Bodhi hides deep inside an untouched village known as Desa Bukian and you might walk by it without noticing. 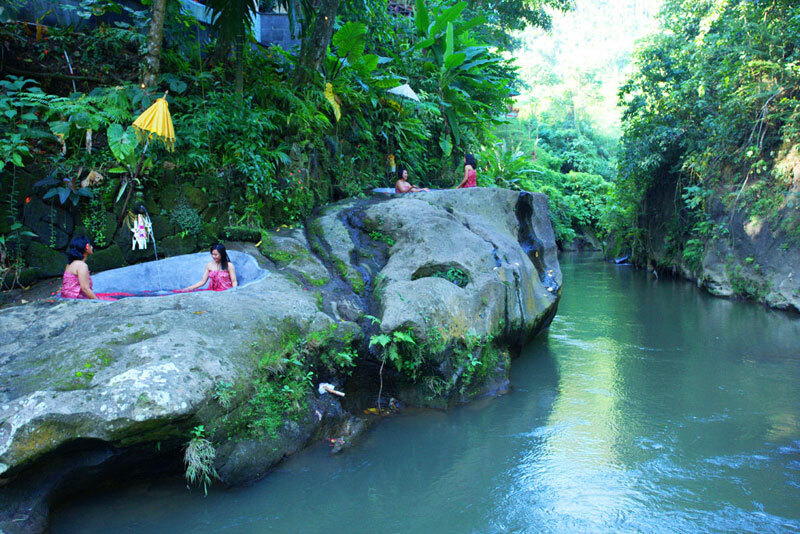 To reach this hidden gem, you have to make your way through an almost impossible-to-find alley in Banjar Tinyingan (a smaller administration of the village) before finally reaching the villa. Of course, the unique hidden location here promises nothing but complete seclusion in nature. You can now leave all your burdens behind and live as free as you wish. Laze in bed all day listening to the chirping birds or choose to have a dip in their infinity pool that overlooks the pristine jungle. 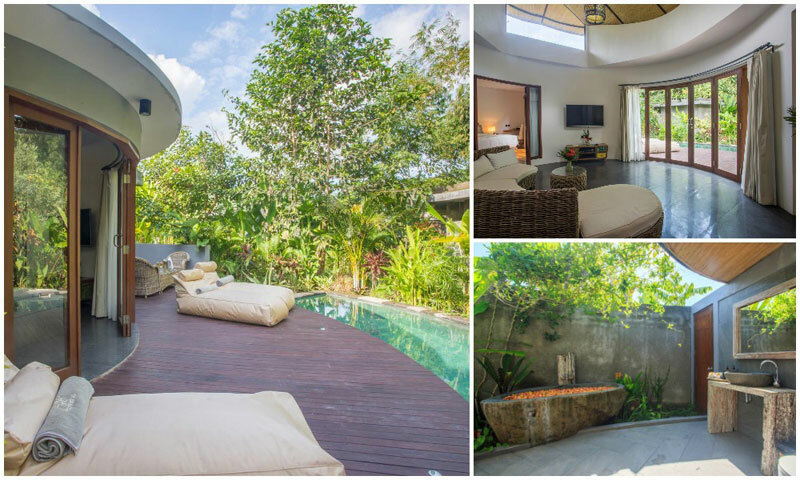 Villa Bodhi is also a great place for those who wish to witness the real side of Bali – one that is untouched by the mass of tourists. The local lifestyle here remains true to its roots and this can be seen from the traditional architecture, daily rituals and the celebration of religious events. You can always ask your villa clerk about upcoming celebrations in the village and if you’re lucky enough you might witness one colourful ceremony! And if you want to experience authentic cuisine in the village, don’t miss the Nasi Ayam (chicken rice) that is located near the village municipality or Bubur Bali near the primary school (only available from 7 am – 9 am). Both are local delights that are worth queuing for! 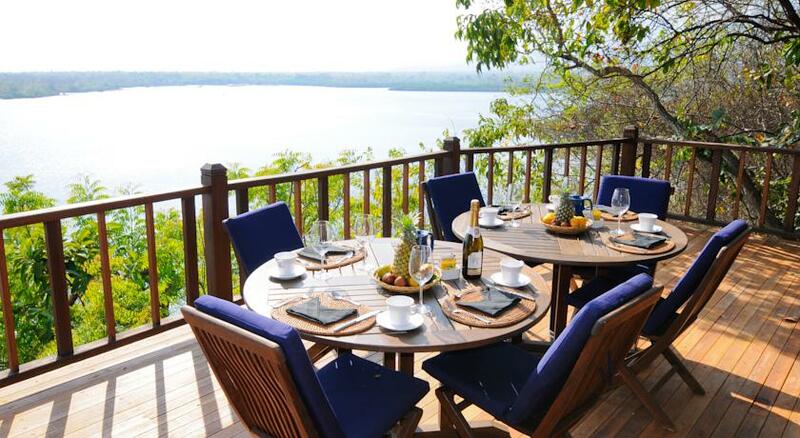 This tropical hideaway promises a lavish retreat in the wild with all necessary comforts and luxuries. 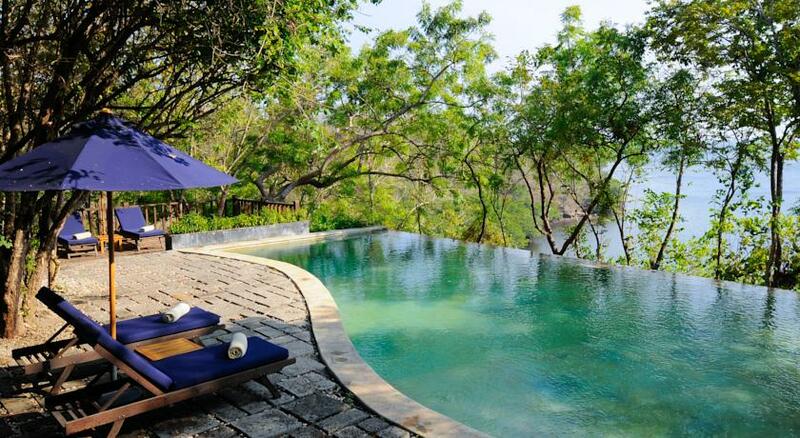 Check in here and indulge all your senses, give your mind and soul an ultimate refreshment. 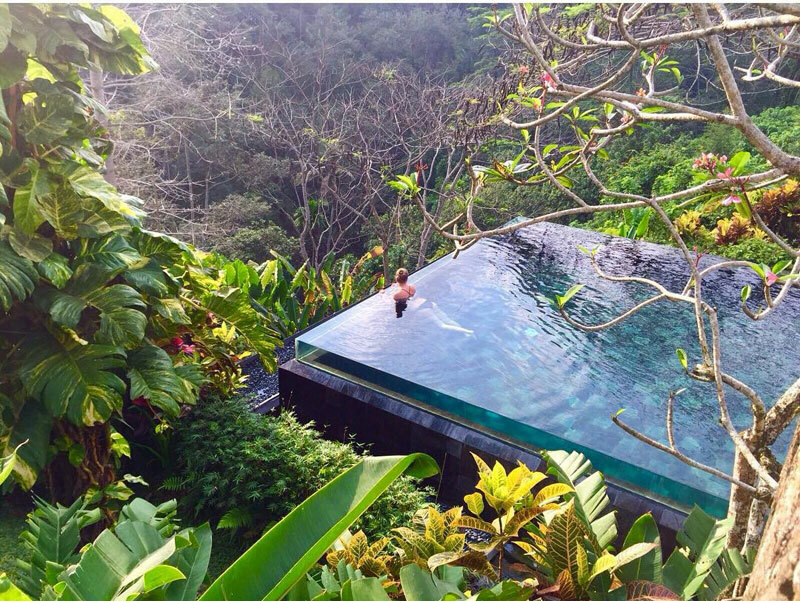 Nothing compares to a soak in their infinity pool while getting hypnotized by the artwork of Mother Nature, where lush forest stretches as far as your eyes can see, along with majestic mountains that serve as a picturesque backdrop. 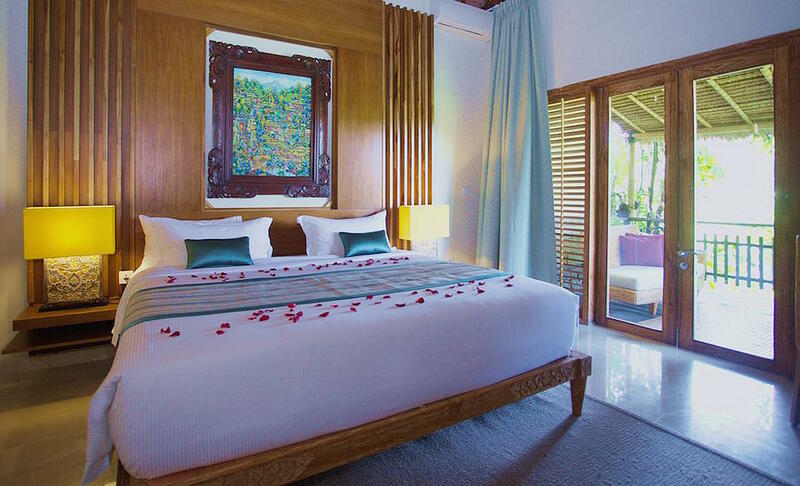 And if you prefer some intimacy, opt for their private pool villa; one where you get to enjoy a secluded and lavish tropical experience, best enjoyed with your lover. Couples, don’t miss out on dropping by the spa to indulge in a chocolate massage – yes, you totally deserve it! 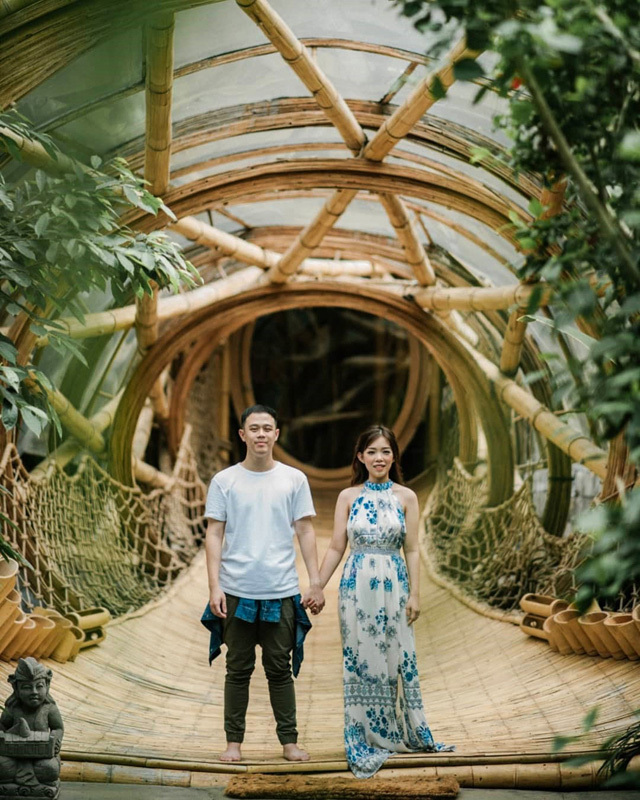 Freshly married couples are probably well aware that the post-wedding bubble is a space best occupied by two — and you only have eyes for each other. 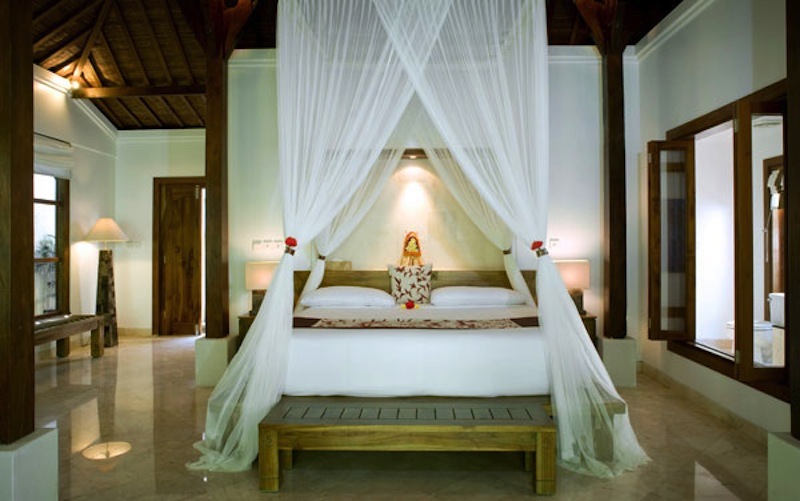 So what better way to immerse yourselves in each other than to spend a few nights in the Honeymoon Suite at Ulun Ubud? 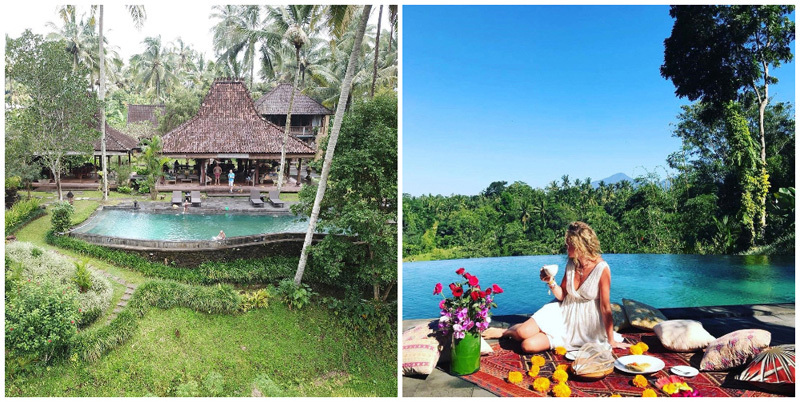 If you fancy a little fun during the day, swim in the infinity pool nestled at the edge of the jungle wildness, or book a little yoga and meditation session to get your zen on. 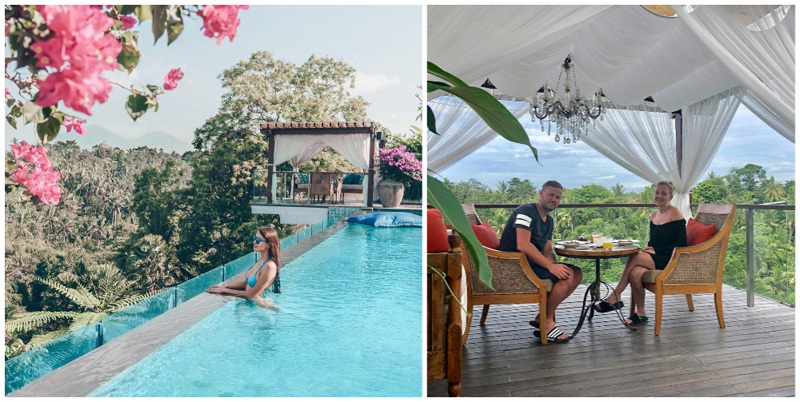 Either way, we’re sure you’ll both be talking about your honeymoon for years to come! With its loft-style villa, Haigha House is a nature wonderland that aims at bringing to life the story of Lewis Carroll’s classic ‘Alice Through the Looking Glass’. 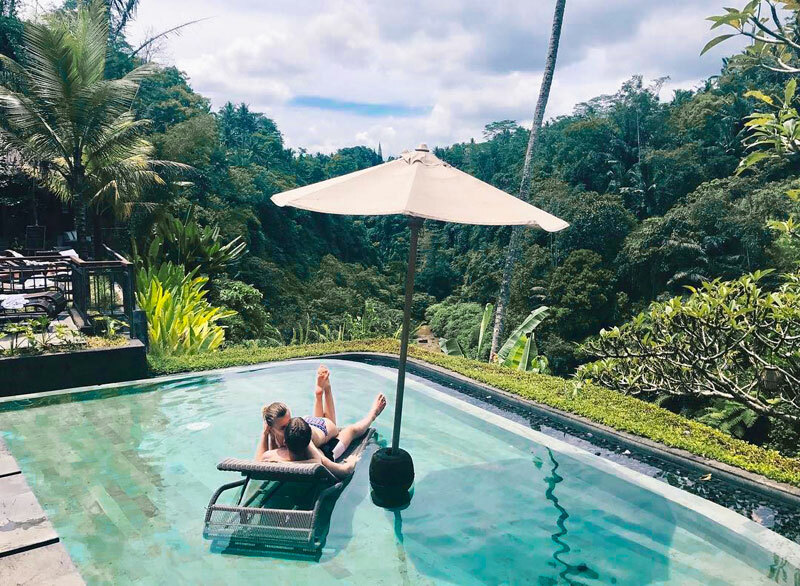 Hidden in the magical forest of Ubud, this is a place where every traveller puts away their adulthood and enjoy a marvelous three-bedroom villa. 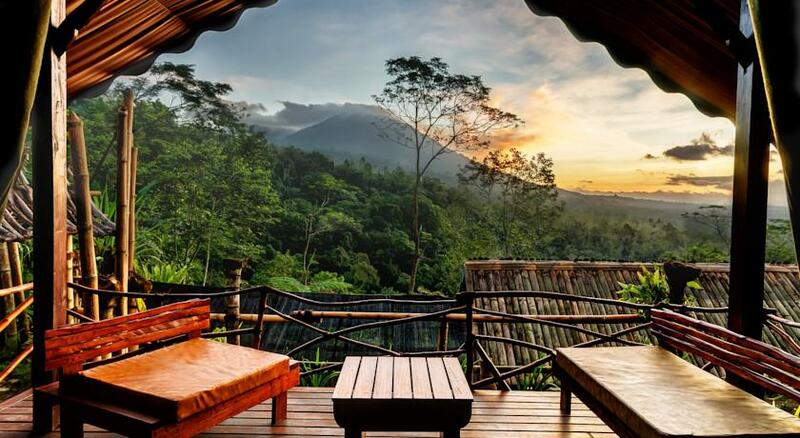 The postcard-perfect panorama of lush rice terraces, pristine jungle, and Batukaru volcanoes come in harmony to ease all your worries away! Every day here is an adventure in magical wonderland. Start your day by enjoying breakfast by the glass window to soak up the sun, followed by a plunge in the stunning infinity pool, all this while being mesmerized by the pristine nature around. And before sunset, go on a mystical treasure hunt to spot on little bunnies roaming free in the yard outside – yes, this villa has adorable fur balls hopping around just like in the Carroll’s fairytale! 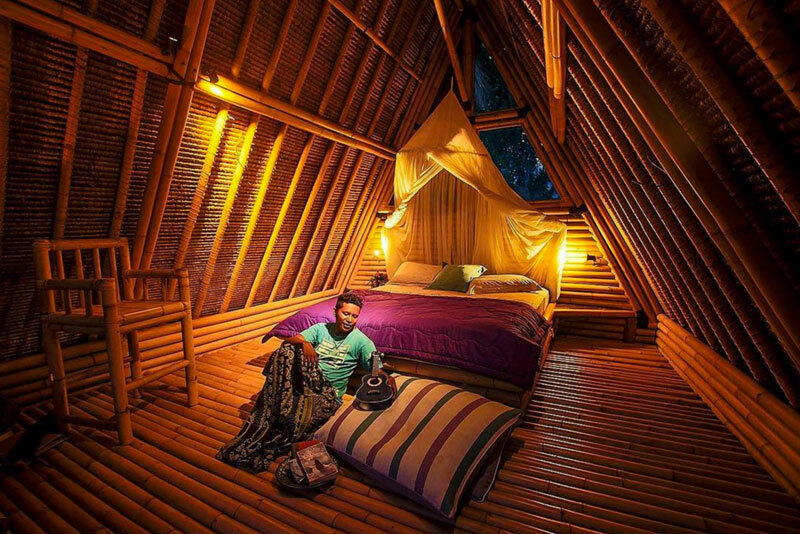 Forget sticky, mosquito-ridden lodgings, let your friends know that you can enjoy a jungle escape in all comfort and luxury! Know where you’re checking into next? Share with us in the comments’ section below!